When you buy a USB charger, how do you know if you're getting a safe, high-quality charger for your money? You can't tell from the outside if a charger provides silky-smooth power or if it is a dangerous charger that emits noisy power that cause touchscreen malfunctions and could self-destruct. In this article, I carefully measure the performance of a dozen different chargers, rate their performance in multiple categories, and determine the winners and losers. The above picture shows the twelve chargers I analyzed. The charger in the upper-left is the cube-shaped Apple iPhone charger. Next is an oblong Samsung adapter and a cube Samsung adapter . The Apple iPad power adapter is substantially larger than the iPhone charger but provides twice the power. 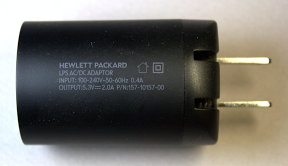 The HP TouchPad power charger has an unusual cylindrical shape. Next is a counterfeit iPhone charger, which appears identical to the real thing but only costs a couple dollars. In the upper right, the Monoprice iPhone charger has a 30-pin dock connector, not USB. The colorful orange charger is a counterfeit of the Apple UK iPhone charger. Next is a counterfeit iPad charger that looks just like the real one. The Belkin power adapter is oval shaped. The KMS power supply provides four USB ports. The final charger is a Motorola Charger . The chargers are rated from 1 to 5 energy bolts, with 5 bolts the best. The overall rating below is the average of the ratings in nine different categories, based on my measurements of efficiency, power stability, power quality, and power output. The quick summary is that phone manufacturers provide pretty good chargers, the aftermarket chargers are worse, and $2 counterfeit chargers are pretty much junk. Much to my surprise, the HP TouchPad charger (which isn't sold any more) turned out to have the best overall score. The counterfeit iPhone charger set a new low for bad quality, strikingly worse than the other two counterfeits. Fake Apple A1265 "Designed by California"
These chargers cram a lot of complex circuitry into a small package, as you can see from the iPhone charger below. 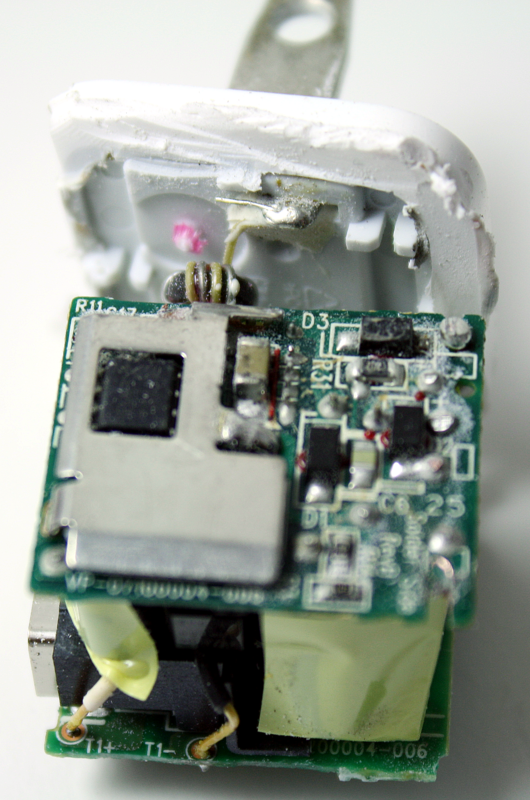 (See my iPhone charger teardown for more details.) The small size makes it challenging to make an efficient, high-quality charger, while the commoditization of chargers and the demand for low prices pressure manufacturers to make the circuit as simple as possible and exclude expensive components, even if the power quality is worse. The result is a wide variation in the quality of the chargers, most of which is invisible to the user, who may believe "a charger is a charger". Internally a charger is an amazingly compact switching power supply that efficiently converts line AC into 5 volt DC output. The input AC is first converted to high-voltage DC. The DC is chopped up tens of thousands of times a second and fed into a tiny flyback transformer. The output of the transformer is converted to low-voltage DC, filtered, and provided as the 5 volt output through the USB port. A feedback mechanism regulates the chopping frequency to keep the output voltage stable. 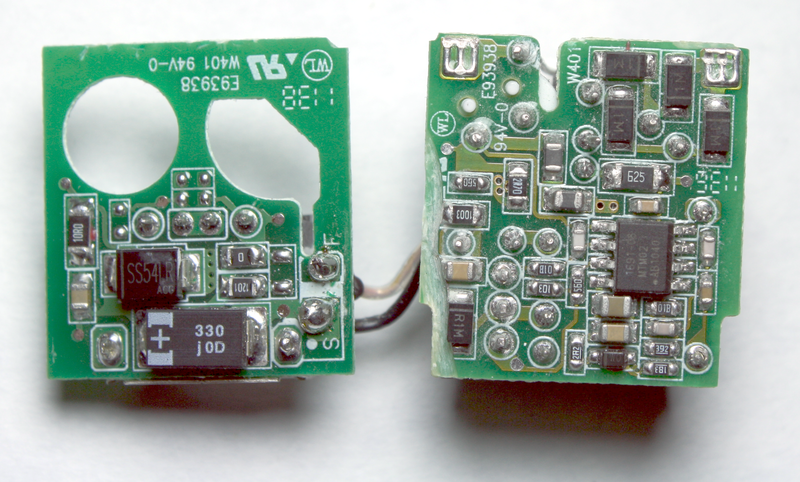 Name-brand chargers use a specialized control IC to run the charger, while cheap chargers cut corners by replacing the IC with a cheap, low-quality feedback circuit. A poor design can suffer several problems. If the output voltage is not filtered well, there will be noise and spikes due to the high-frequency switching. At extreme levels this could damage your phone, but the most common symptom is the touchscreen doesn't work while the charger is plugged in. A second problem is the output voltage can be affected by the AC input, causing 120 Hz "ripple". Third, the charger is supposed to provide a constant voltage. A poor design can cause the voltage to sag as the load increases. Your phone will take longer to charge if the charger doesn't provide enough power. Finally, USB chargers are not all interchangeable; the wrong type of charger may not work with your device. Counterfeit chargers pose a safety hazard as well as a hazard to your phone. You can buy a charger that looks just like an Apple charger for about $2, but the charger is nothing like an Apple charger internally. The power is extremely bad quality (as I will show below). But more importantly, these chargers ignore safety standards. Since chargers have hundreds of volts internally, there's a big risk if a charger doesn't have proper insulation. You're putting your phone, and more importantly yourself, at risk if you use one of these chargers. I did a teardown of a counterfeit charger, which shows the differences in detail. I've taken apart several counterfeit chargers and readers have sent me photos of others. Surprisingly, the counterfeit chargers I've examined all use different circuitry internally. If you get a counterfeit, it could be worse or better than what I've seen. How do you tell if a charger is counterfeit? The fakes are very similar; it's hard for me to tell, even after studying many chargers. There's a video on how to distinguish real and fake chargers through subtle differences. You can also weigh the charger (if you have an accurate scale), and compare with the weights I give above. The easiest way to get a genuine Apple charger is fork over $29 to an Apple store. If you buy a $2 "Original Genuine Apple" charger on eBay shipped from China, I can guarantee it's counterfeit. On the other hand, I've succeeded in buying genuine used chargers from US resellers for a moderate price on eBay, but you're taking a chance. The following picture shows a counterfeit charger that burned up. The safety issues with counterfeits are not just theoretical; when hundreds of volts short out, the results can be spectacular. A device being charged can detect what type of charger is being used through specific voltages on the USB data pins. Because of this, some devices only work with their own special chargers. For instance, an "incorrect" charger may be rejected by an iPhone 3GS or later with the message "Charging is not supported with this accessory". There are many different charger types, but only a few are used in the chargers I examined. A USB charger that follows the standard is known as a "dedicated USB charger". However, some manufacturers (such as Apple, Sony, and HP) don't follow the USB standard but implement their own proprietary charger types. Apple has separate charger types for 1 amp (iPhone) and 2 amp (iPad) chargers. HP has a special type for the HP TouchPad. The point is that USB chargers are not interchangeable, and devices may not work if the charger type doesn't match what the device expects. The table below shows the type of charger, the current that the label claims the charger provides, the current it actually provides, and the charger type it indicates to the device. The types of the counterfeit chargers are a mess, as they advertise one power level, actually supply a different power level, and have the charger type for a third level. 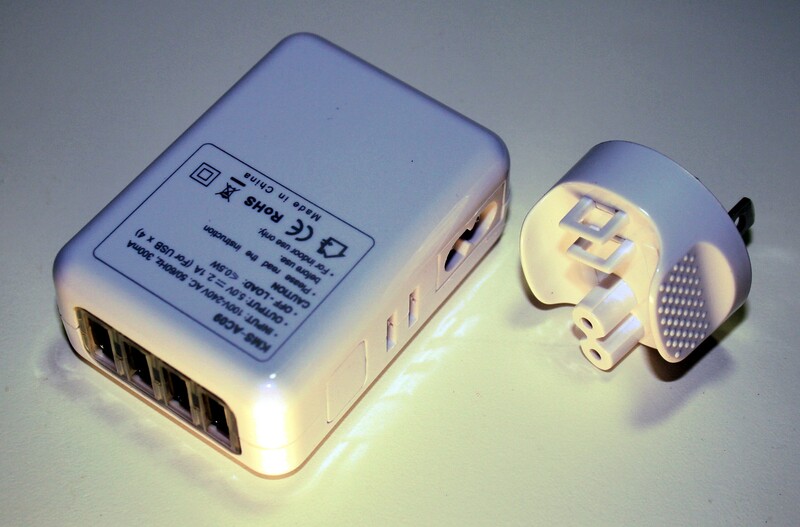 For example, the counterfeit iPhone charger is advertised as supplying 1 amp, but has the 2A charger type, so an iPad will expect 2 amps but not obtain enough power. On the other hand, the counterfeit iPad charger claims to supply 2 amps, but really only supplies 1 amp and has a 1A type. People often wonder how much power their charger is wasting while it's idle, and if they should unplug their charger when not in use. I measured this "vampire" power usage and found the chargers varied by more than a factor of 20 in their idle power usage. The Samsung oblong charger came in best, using just 19 mW; this was so low compared to the other chargers that I measured it again a different way to make sure I hadn't made an error. On the other extreme, the fake iPhone charger used 375 mW. The Apple iPhone charger performed surprisingly badly at 195 mW. If plugged in for a year, this would cost you about 21 cents in electricity, so it's probably not worth worrying about. In the following table, I use the official charger Star Rating System (yes, there actually is such a thing). I also measured efficiency of the chargers under load. One of the benefits of switching power supplies over simpler linear supplies is they are much more efficient at converting the input power to output. The chargers I measured all did pretty well, with 63% to 80% efficiency. The HP charger was the winner here. The above photo shows a real iPhone charger (left) and a counterfeit (right); the two chargers are almost identical, down to the green dot. If you look closely, the genuine one says "Designed by Apple in California", while the counterfeit has the puzzling text "Designed by California". 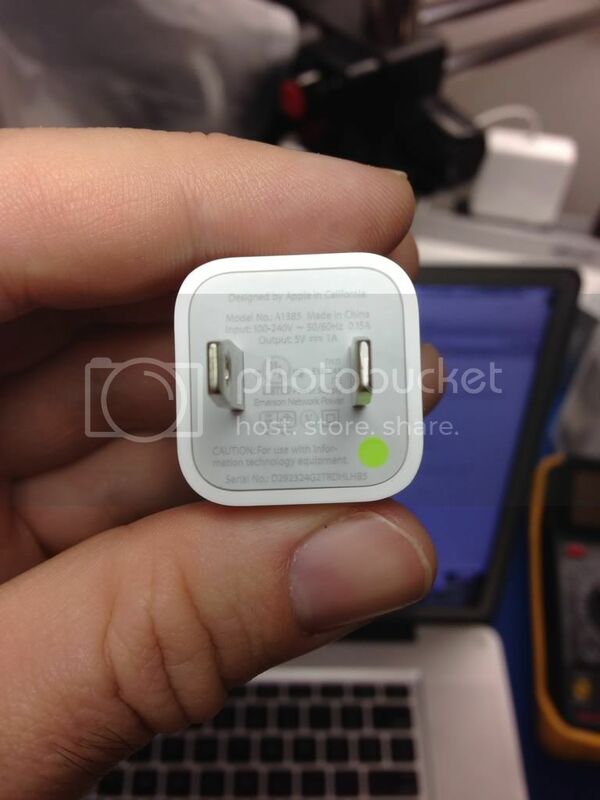 The counterfeit also removed the "Apple Japan" text below the plug. I've seen another counterfeit that says "Designed by Abble" (not Apple). I assume the word "Apple" is removed for legal or trademark reasons, since the word "Apple" is often (but not always) missing from counterfeits. I call this charger the Samsung oblong charger, to distinguish it from the Samsung cube charger. The Samsung cube charger is shaped very similarly to the Apple iPhone charger. Internally, however, it turns out to be entirely different. The photo above shows a real iPad charger (left) and a counterfeit (right). The counterfeit has almost identical text, but without "Designed by Apple in California. Assembled in China", "Listed" under UL, and the manufacturer "Foxlink". Inexplicably this sanitization left "TM and © 2010 Apple Inc". 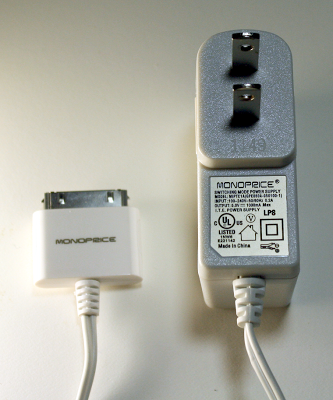 The Monoprice charger isn't a USB charger, but instead has a 30-pin iPhone dock connector attached. It is a relatively large charger. This charger is a counterfeit of the Apple UK iPhone charger. They've removed Apple from the text, but left Emerson Network Power, which I'm sure is not the actual manufacturer. The genuine Apple UK charger can be distinguished by a serial number inside the USB connector. The Belkin charger eschews the minimal design styling of most chargers, with a roughly oval cross section, curves and ribs, and a cover over the USB port. The KMS charger is unusual in providing 4 USB ports. It also gives off a blue glow while in use. 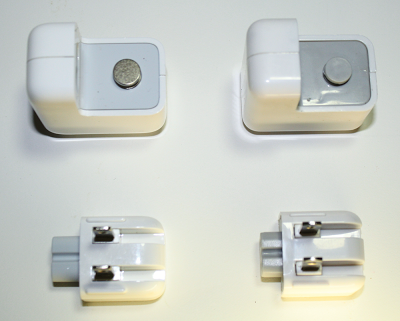 The plug can be removed and replaced for use in different countries, similar to the iPad and HP TouchPad chargers. I couldn't find any UL safety approval on this charger, but I did find a report of one catching fire. 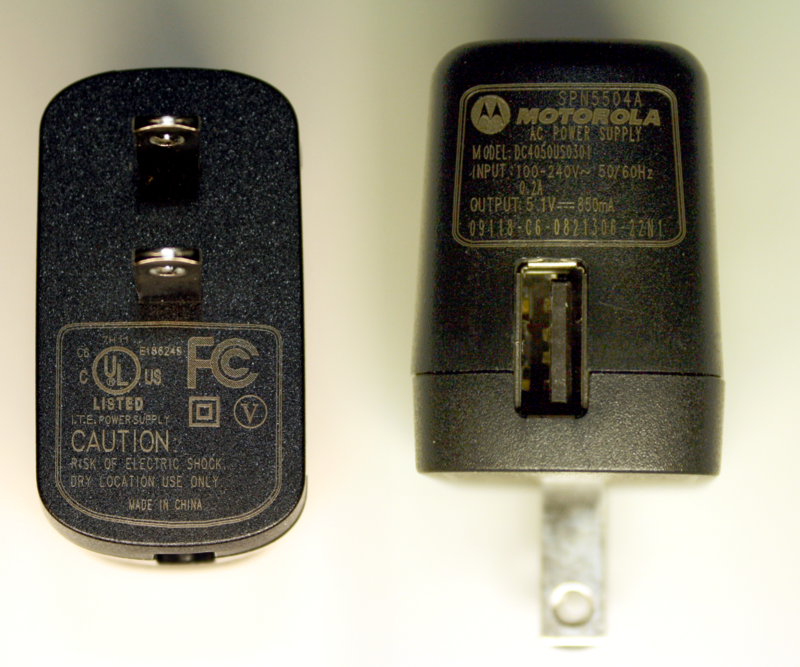 The Motorola charger has the lowest listed power output, 850mA. The back of it has a holographic sticker (like a credit card), which may ward off counterfeiters, even though it's unlikely for anyone to counterfeit this charger. I wonder though why Apple doesn't use holograms or other anti-counterfeiting techniques, given the large number of counterfeit Apple chargers being sold. Each charger has an advertised power output, but some chargers produce considerably more and some produce much less. Your device will take longer to charge, if the charger can't put out enough power. This table shows each charger's ability to deliver the rated power, based on my measurements of maximum power. While most chargers meet or exceed the power rating, there are some exceptions. The counterfeit chargers perform extremely poorly, putting out a fraction of the expected power. Charging your device with one of these chargers will be a slow, frustrating experience. 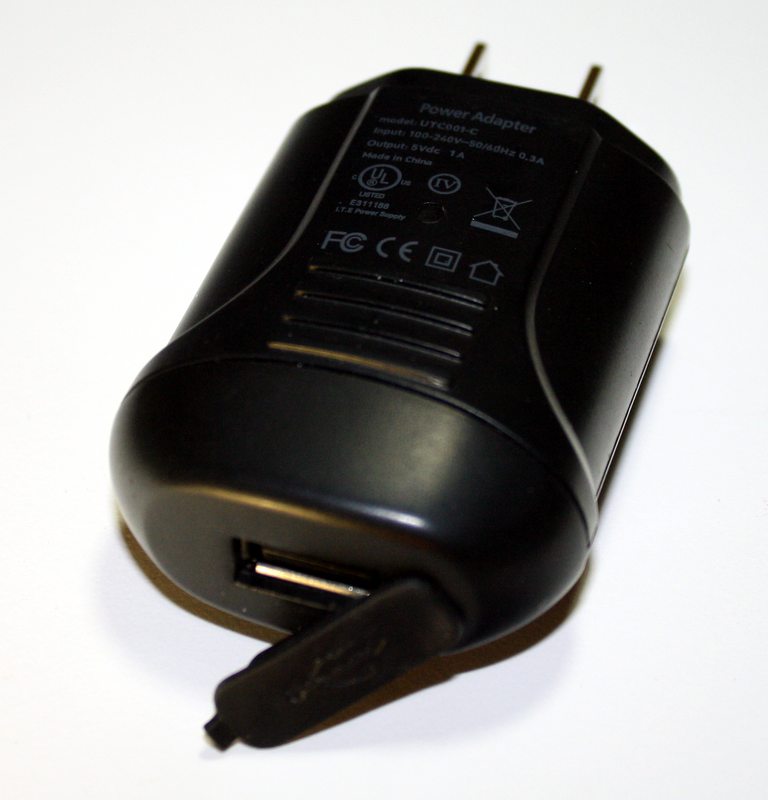 In particular, the counterfeit UK charger only produces a third of the expected power. Although the label claims the charger works on 100-240 volts, it's clearly not designed to work on US power. The iPad is a surprise, putting out less power than expected. Despite being nominally a 10 watt charger, the label says it provides 5.1V and 2.1A, which works out to 10.7 watts. However, the maximum power I measured is 10.1 watts (4.4 volts at 2.3 amps, as shown in the Power section below). Since the measured power is slightly less than advertised, it only gets four bolts. In this section, I measure the quality of the power produced by the different chargers. I analyze it for voltage spikes, high frequency noise, and line-frequency ripple. The following table summarizes the results in three categories. Spikes indicates extremely brief large voltage spikes in the output, while Noise indicates high-frequency noise in the output, and Ripple indicates low-frequency (120 Hz) fluctuations in the output. 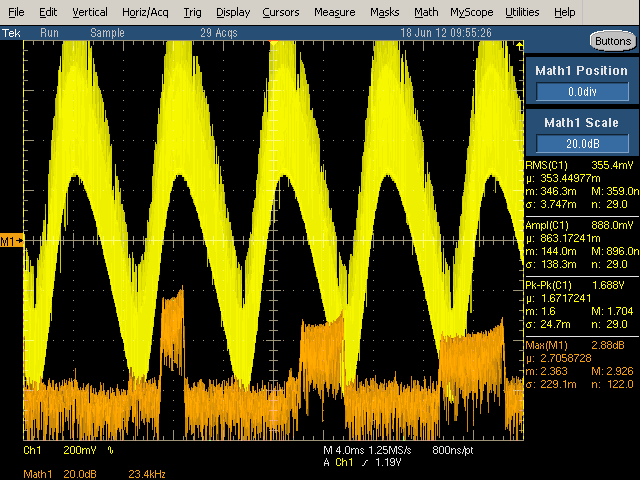 The following oscilloscope traces show the output signal (yellow) and frequency spectrum (orange). 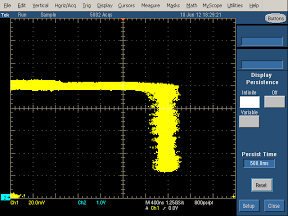 The left images provide high-frequency information on the output voltage. The right images show the low-frequency information on the output voltage. 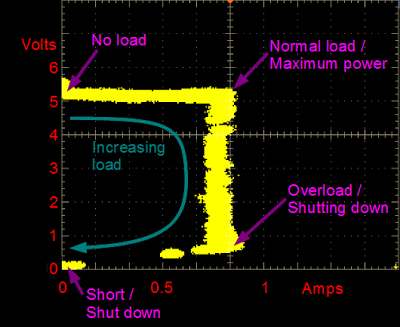 The desired voltage graph is a flat, thin yellow line indicating totally smooth power. However, some factors mess this up. 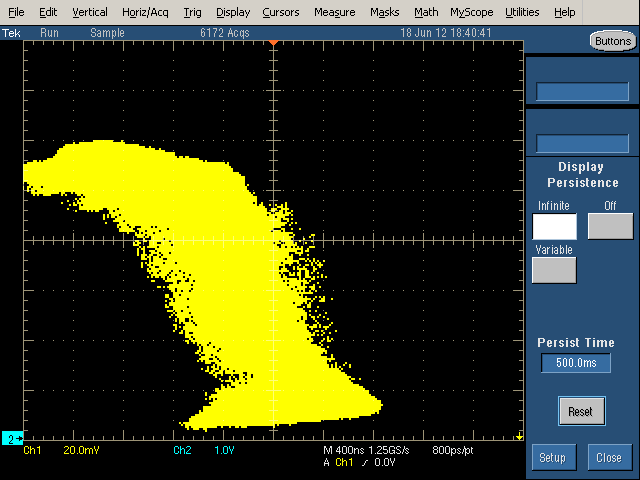 First, any ripple from the power line will show up as 5 sinusoidal peaks in the first (high-frequency) yellow line. 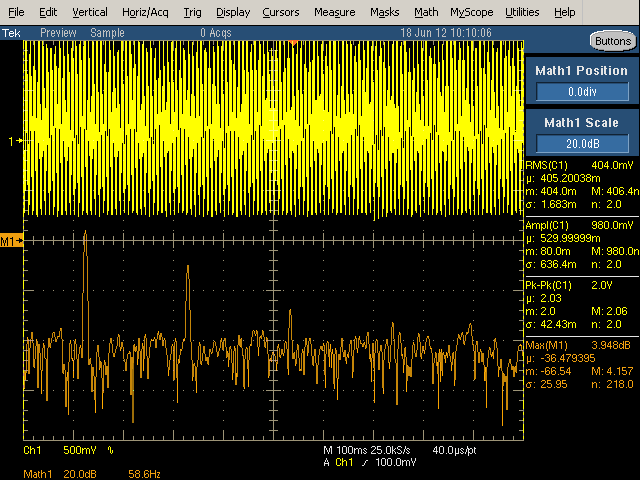 High-frequency noise will widen the yellow line. 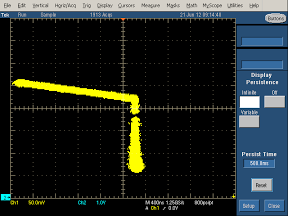 Voltage spikes will appear as vertical spikes in the yellow line. 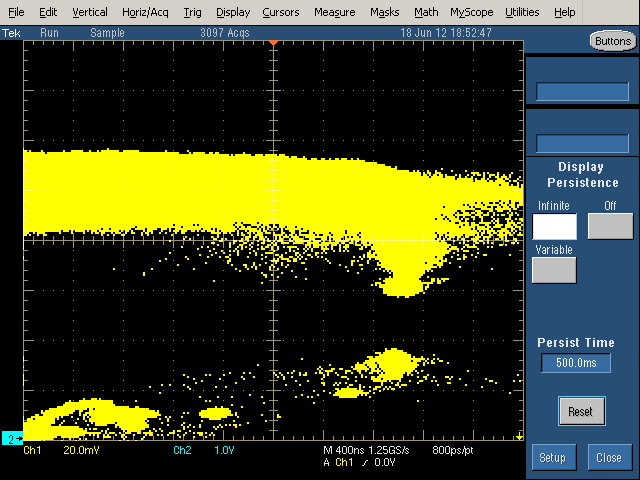 The plots also show the frequency spectrum in orange, from 0 at the left to 230 kHz at the right. The desired graph would have the orange spectrum near the bottom of the screen. Thus, the power quality exponentially gets worse as the orange line gets higher. The left (high frequency) spectrum generally shows noise at the switching frequency of the charger (and harmonics). The right (low frequency) spectrum typically shows spikes at multiples of 120 Hz, caused by ripple from the 60 Hz power. The ripple is clearly visible as the waves in the yellow trace on the left and as the spikes (at 120 Hz and 240 Hz) in the orange trace on the right. The iPhone charger performs extremely well at filtering out spikes and noise, the best of the chargers I measured. 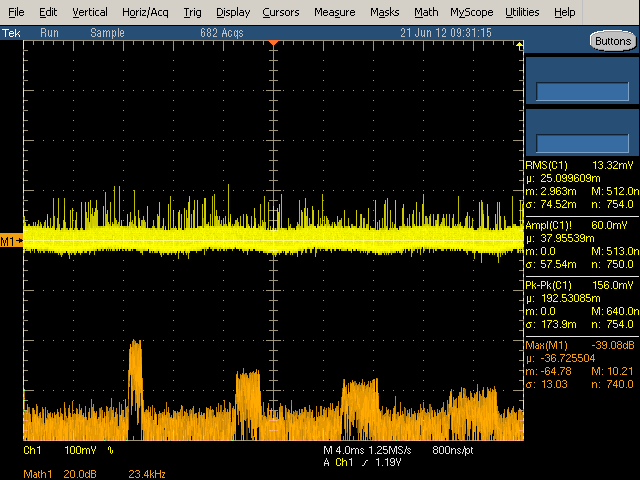 Apart from the 120 Hz spikes, the noise spectrum (orange) is flat and very low. The power quality is so good, I checked the results several times to make sure I wasn't missing something. The Samsung charger's output has a lot more noise than the iPhone charger. This is visible in the thickness and jaggedness of the yellow output curves. 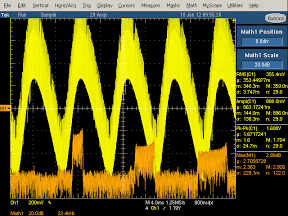 The orange frequency spectrum on the left shows large peaks at harmonics of the switching frequency. The 120 Hz spike on the right is a bit lower than the iPhone charger, so the ripple filtering is a bit better. 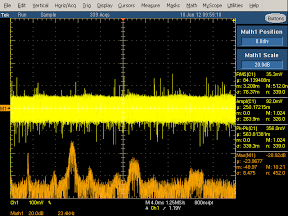 The Samsung cube charger shows some noise in the output (yellow). 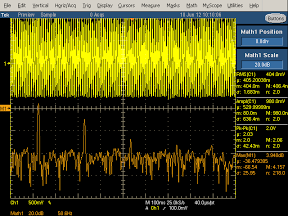 The frequency spectrum shows wide peaks at multiples of the the switching frequency, about 90kHz. There's some ripple. 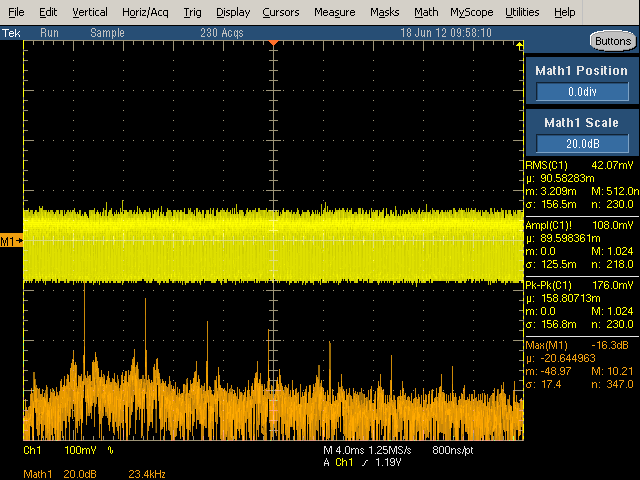 The iPad charger almost eliminates the ripple; only a small blip is visible in the orange spectrum on the right. The noise level is low, although appreciably worse than the iPhone. There's no ripple visible in the HP charger spectrum on the right. The overall noise level is good. The output from this counterfeit charger is a wall of noise. In order to fit the waveform in the display, I had to double the scale on the left and increase it by a factor of 5 on the right, so the yellow curve is actually much worse than it appears. On the left, note the huge ripple with massive high-frequency noise on top. This output is not something you want to feed into your phone. 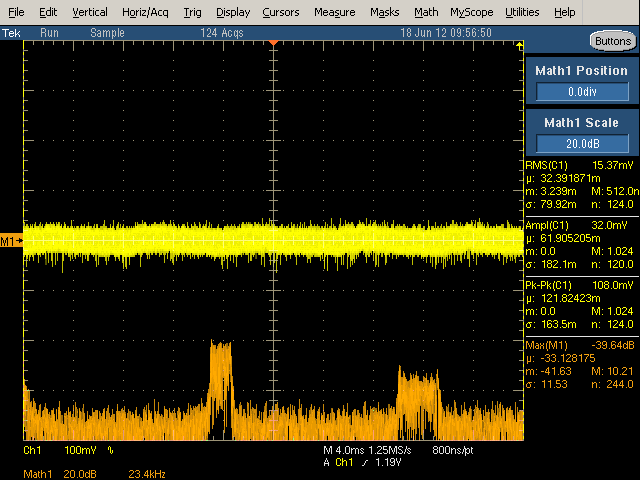 The output from this charger is very noisy, as you can see from the thickness of the yellow line. 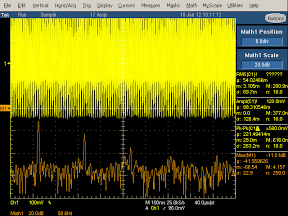 Note that the frequency spectrum (left) has very tall but narrow spikes at harmonics of the 28kHz switching frequency, showing a lot of high-frequency noise. On the positive side, there is hardly any ripple. This charger has very bad output. 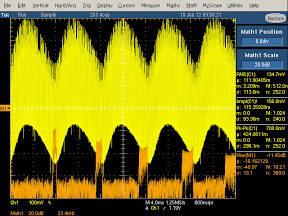 The large degree of ripple is visible in the waveform (yellow, left) and the very large spikes in the spectrum (orange, right). 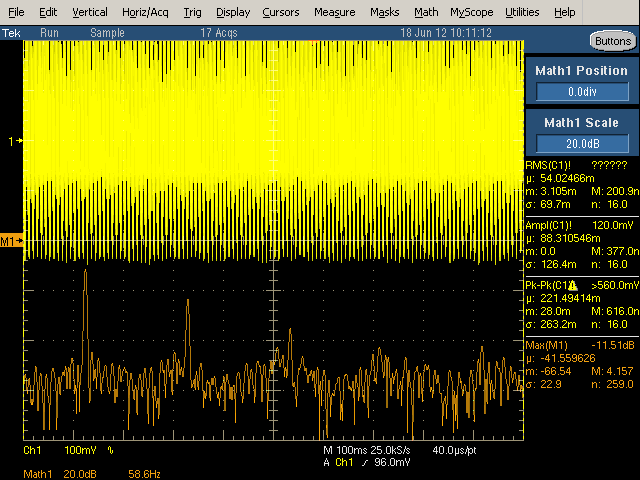 The thickness of the yellow waveform shows the large amount of high-frequency noise, which is also visible in the very high peaks in the spectrum (orange, left). This counterfeit charger has so much noise in the output that I had to double the scale on the left to get it to fit. 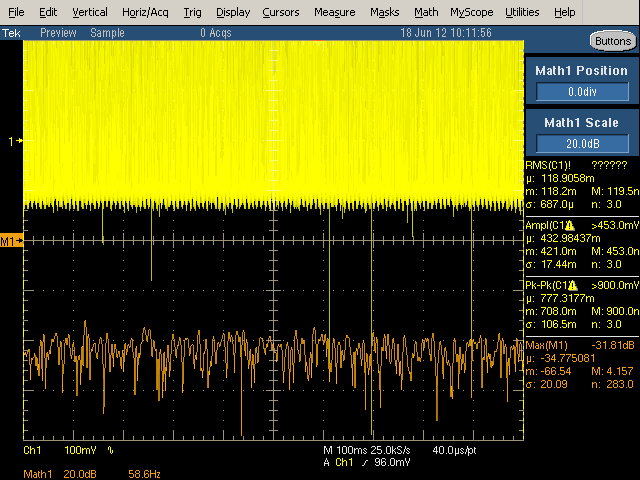 Note the very large spikes in the output (yellow). The spectrum (orange, left) is much higher everywhere, indicating noise at all frequencies. Surprisingly, it has only a moderate amount of ripple; the manufacturer seems to have done at least one thing right. The Belkin charger does well at eliminating ripple, but has a lot of noise otherwise. The spectrum (orange, left) shows large peaks. 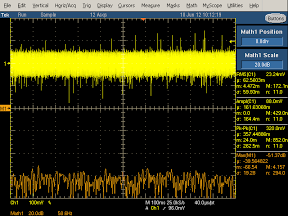 The yellow output is wide, showing a lot of noise, combined with many large voltage spikes of about 1/3 volt. 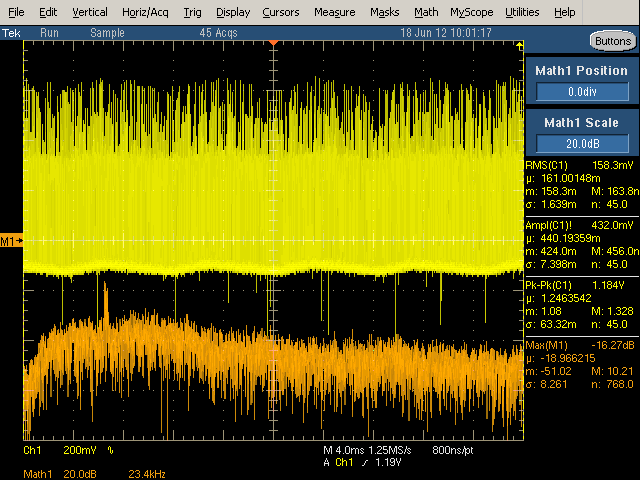 The KMS charger has fairly good output, with a small peak in the spectrum (orange, left) at the switching frequency. It has no detectable ripple. However, it has many large voltage spikes in the output, over half a volt, as can be seen on the right. The Motorola charger has a lot of spikes in the output (yellow) . The spectrum (orange, left) shows high frequency noise at the switching frequencies. There's a moderate amount of ripple (yellow, left and orange, right). 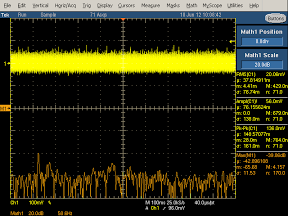 The quality of the output power is radically different between chargers. The counterfeit chargers are uniformly bad, with hardly any effort at filtering the output. The other chargers vary in quality with the iPhone charger setting the standard for noise-free power, but surprisingly poor filtering of ripple. The power quality is a key factor that affects the performance of chargers; spikes and noise are known to interfere with touchscreens. In this section I look at the voltage and current output by the charger as the load increases. The first rating is Voltage Sag, which is the undesired drop in output voltage as the load increases. The second rating is Current Sag, which shows how the current fluctuates as load increases. Finally, Regulation shows the overall stability of the output from the charger. The graphs in this section need a bit of explanation, which is provided in the diagram below. The voltage/current load curve shows the performance of the charger under different loads. Each point on the curve shows the current (X axis) and voltage (Y axis) produced by the charger under a particular load condition. Follow the yellow curve clockwise from the upper left to the lower left to see the effect of increasing load. The upper left point of the curve shows the voltage produced by the charger when there is no load on the charger. As the load increases, the charger is supposed to keep a constant voltage and increase the current (i.e. horizontal line), until it reaches the maximum power (upper right). If the load continues increasing, the charger switches to a constant current mode, dropping the voltage while continuing to provide the maximum current (i.e. vertical line). At the lower right, the charger has reached its shutdown point due to excessive load, and rapidly drops to no output in the lower left corner to avoid damage. The output from the Apple iPhone charger is surprisingly non-constant under load. The charger starts off with 5.2 volts with no load, dropping to 4.6 volts as the load increases, resulting in the downwards slope of the top yellow line. As the load increases, the current keeps increasing, resulting in the slope of the right yellow line. Note however that the yellow line is relatively thin, so the regulation is pretty good at each point. Note that because this charger has a high current output, this chart has a different current (horizontal) scale than most of the charts to fit the whole trace in the image. Stretch it horizontally to compare with other graphs. For this charger, the voltage is approximately flat, except for a bump under no load (upper left) which is probably a measurement artifact. 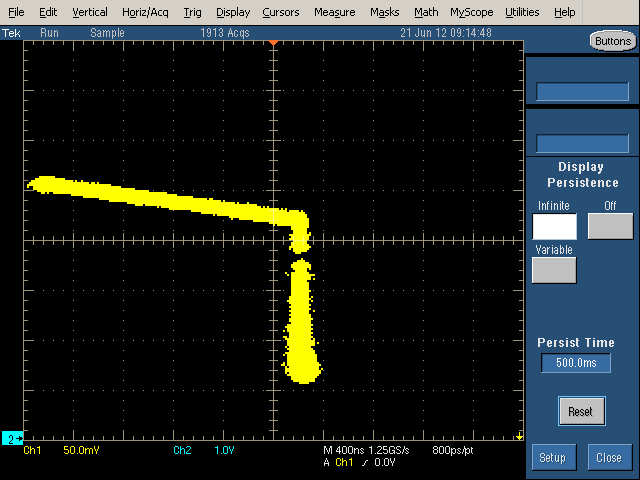 The vertical yellow line shows the current stays nearly constant as the load increases. The charger shows good voltage and current stability under changing load. 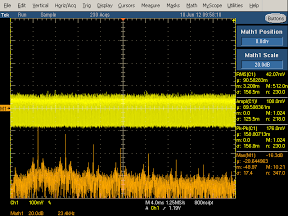 The yellow line is a bit wider than the iPhone charger, showing a bit less regulation for a fixed load. The voltage curve sags slightly under load. The right hand curve shows the current stays stable, but the line is moderately wide, showing a bit of weakness in regulation. Similar to the iPhone charger, the iPad charger shows a lot of voltage sag. The voltage is about 5.1 V unloaded, dropping to 4.4 volts and 2.3 A (10.1 W) at the corner. Unlike the iPhone charger, the iPad charger has pretty good current stability. The regulation is solid, as shown by the narrowness of the yellow trace. Note the scale change due to the high current output. I'm puzzled by the steep voltage sag on both the iPhone and iPad charger. Since the designers of the Apple charger went to a great deal of effort to build a high quality charger, I conclude they must not consider voltage sag worth worrying about. Or, more interestingly, maybe they built this sag as a feature for some reason. In any case, the chargers lose points on this. The charger has some voltage sag, but the current (vertical) is nice and constant. The yellow line is relatively thin, showing good regulation. Note the scale change due to the high current output. This counterfeit charger shows extremely poor regulation, as shown by the very wide yellow line. It's hard to fit a voltage-current curve to this picture. The amount of power supplied by this charger seems almost random. 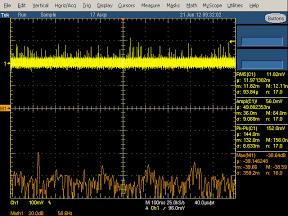 The Monoprice charger shows reasonably straight voltage and current lines showing good constant voltage and current outputs. The vertical line shows some width and noise, suggesting the regulation isn't totally stable. For this charger, the upper line doesn't get very far, showing that this charger doesn't output much current. My suspicion is that it was only tested with 240 volts so it performs poorly with 120 volts, even though the label says it takes 100 to 240 volts. The width of the yellow line shows very poor regulation. The output of this counterfeit charger is so poorly regulated that it's hard to tell exactly what's happening with the voltage and current. It looks like the voltage is roughly constant underneath all the noise. The Belkin charger shows voltage sag as the current increases. In addition, the output is fairly noisy. 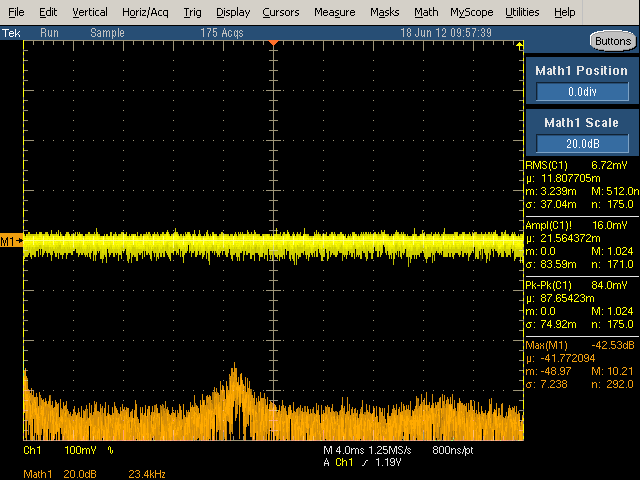 The KMS charger shows a lot of voltage sag as the load increases. In addition, the output is all over the place, showing very poor regulation, more like what I'd expect from a counterfeit charger. Note the scale change due to the high current output. The Motorola charger shows a bit of voltage sag, but good current stability. The regulation is good but not perfect, as shown by the width of the yellow line. 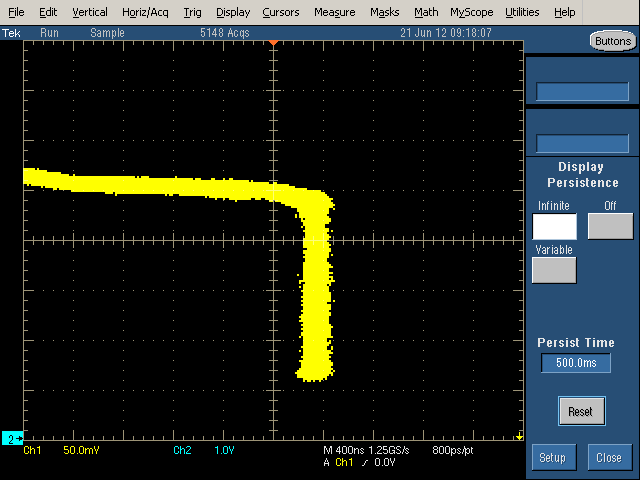 (The gaps in the vertical line are just measurement artifacts.) Note that the maximum current output of this charger is fairly low (as advertised). So what charger should you spend your hard-earned money on? First, make sure the charger will work with your phone - for instance, newer iPhones only work with certain chargers. Second, don't buy a counterfeit charger; the price is great, but it's not worth risking your expensive device or your safety. Beyond that, it's your decision on how much quality is worth versus price, and I hope the data here helps you make a decision. P.S. How about some teardowns? My previous iPhone charger and fake charger teardowns were surprisingly popular, but if you were hoping for teardowns on the full set of chargers, you'll need to wait for a future blog post. I haven't torn the chargers apart yet; if I need to take more measurements, I don't want to have just a pile of parts. But I do have some preview pictures to hold you over until my teardown article. 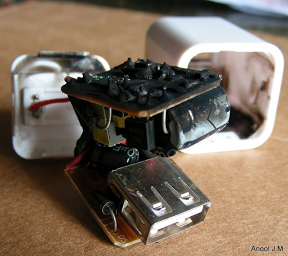 The above picture shows the internals of a counterfeit Apple iPhone cube charger. The two boards stack to form the compact cube shape. This charger blatantly tries to pass as a genuine Apple charger; unlike the "Designed by California" charger, this one exactly copies the "Designed by Apple in California" text from the real charger. Note the very simple circuitry - there are no components on the other side of the board, no controller IC, and very little filtering. Also look at the terrible mounting of the transistor on the front right; clearly the build quality of this charger is poor. Finally, note the overall lack of insulation; this charger wouldn't meet UL safety standards and could easily short out. But on the plus side, this charger only cost a couple dollars. The above $2 charger is notable for its low-profile design; it's about as thin as you can make a charger and still fit the power prongs and the USB port. The transformer is very short to fit into this charger. Like the previous charger, it uses a very simple circuit, has little filtering, and almost no safety insulation. Finally, the above pictures show the internals of the Samsung cube charger, which has circuit boards packed with tiny components and is much more advanced than the counterfeits (although slightly less complex than the Apple charger). Despite being very similar to the Apple charger on the outside, the Samsung charger uses an entirely different design and circuitry internally. One interesting design feature is the filter capacitors fit through the cut-out holes in the secondary circuit board, allowing the large filter capacitors to fit in the charger. More comments on this article are at Hacker News and reddit. Thanks for visiting! For an explanation of how the noisy output from cheap chargers messes up touchscreens, see Noise Wars: Projected Capacitance Strikes Back. The charger selection may seem slightly eccentric; it is based on chargers I had previously acquired, chargers I could obtain at a reasonable price, chargers supplied by Gary F. and Anthony H. (thanks, guys! ), and some counterfeit chargers for comparison. TI has an interesting new design for a 10 watt inch-cube charger. With this design a tablet charger could be as small as the iPhone charger. 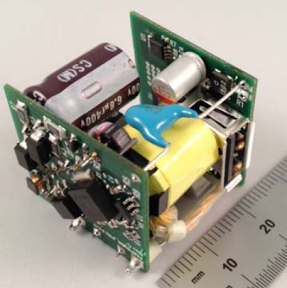 Photo of PMP8286 10W cube charger used with permission from Texas Instruments. The cheap chargers all use a "ringing choke converter" circuit, which coincidentally is the same power supply topology used by the Apple II. These chargers use an extremely simple feedback mechanism in place of the control IC in higher-quality chargers. See a comic-book explanation or a technical explanation for details. Since the input AC has a frequency of 60 Hertz, you might wonder why the ripple in the output is 120 Hertz. The diode bridge converts the 60 Hz AC input to 120 Hz pulsed DC, as shown in the diagram below. The pulses are smoothed out with filter capacitors before being fed into the switching circuit, but if the filtering isn't sufficient the output may show some 120 Hz ripple. The chargers use specific voltages on the data pins to indicate the charger type to the device being charged. Because of this, an "incorrect" charger may be rejected by an iPhone with the message "Charging is not supported with this accessory". Under the USB standard, a charger should short the two data pins together to indicate that it's a "dedicated" charger and not a real USB device. However, companies such as Apple, HP, and Sony have their own proprietary nonstandard techniques. The following table summarizes the voltages that appear on the D+ and D- lines for different chargers, and how the D+ and D- lines are configured internally. Most of this data is based on Maxim USB Battery Charger Detectors, Adafruit's The mysteries of Apple device charging, TouchPad's USB Cable, XDA forum (Samsung), and TPS2511 USB Dedicated Charging Port Controller and Current Limiting Power Switch datasheet. The Apple 2A (i.e. iPad) information is a new result from my measurements. For details on USB charging protocols, see my references in my earlier posting. Amusingly, semiconductor manufacturers have recently introduced chips that allow chargers to sequentially pretend to be different proprietary chargers until they trick the device into accepting the charger. It seems crazy that companies (such as Apple) design incompatible chargers, and then chip companies invent schemes to work around these incompatibilities in order to build universally compatible chargers. 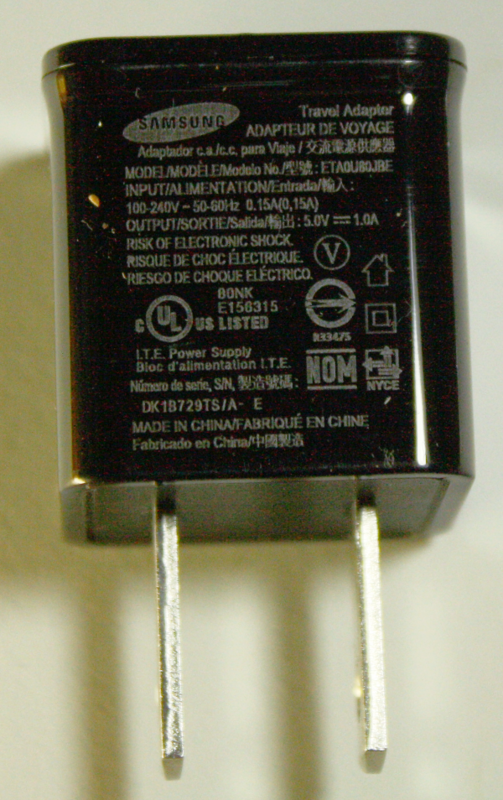 Two example chips are the TI TPS 2511 chip, and SMSC's USC1001 controller, which pretends to be nine different charger types. If you've wondered why some chargers cause the iPhone to give a "Charging not supported with this accessory" error, Silicon based annoyance reduction made easy describes how devices use proprietary protocols to limit the chargers they will work with. For the efficiency analysis I use 12 cents / kilowatt-hour as a typical residential energy price, which I got from US Energy Information Administration table 5.3. The official no-load charger star ratings are discussed at Meeting 30 mW standby in mobile phone chargers. There are many standards for energy consumption; see 5 W Cellular Phone CCCV (Constant Current Constant Voltage) AC-DC Adapter. For Energy Star ratings, a 5W charger must have under .5W no-load consumption, and 63% efficiency under load. A 10W charger must have under .75W no-load consumption, and 70% efficiency. 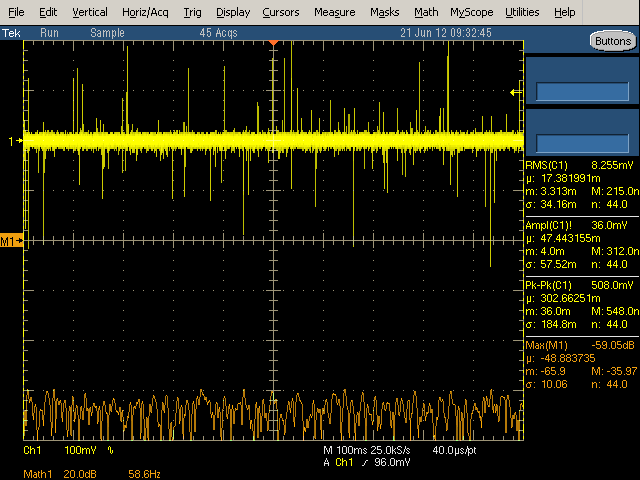 Because switching power supplies use power in irregular waveforms, I used a complex setup to measure power consumption. I measured the AC input voltage and current with an oscilloscope. The oscilloscope's math functions multiplied the voltage and current at each instant to compute the instantaneous power, and then computed the average power over time. For safety and to avoid vaporizing the oscilloscope I used an isolation transformer. My measurements are fairly close to Apple's, which is reassuring. You might wonder why I didn't just use a Kill A Watt power monitor, which performs the same instantaneous voltage * current process internally. Unfortunately it doesn't have the resolution for the small power consumptions I'm measuring: it reports 0.3W for the Apple iPhone charger, and 0.0W for many of the others. Ironically, after computing these detailed power measurements, I simply measured the input current with a multimeter, multiplied by 115 volts, and got almost exactly the same results for vampire power. The spike, noise, and ripple measurements come from the oscilloscope traces. The Spikes measurement is based on the maximum peak-to-peak voltage on the high frequency trace (the low frequency trace yields almost identical results). The Noise measurement is based on the RMS voltage on the high-frequency trace, and Ripple is based on the maximum dB measured in the low-frequency spectrum. These measurements appear on the right in the traces. 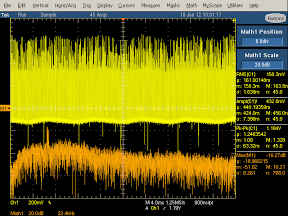 In the power quality section, the high-frequency (left) images show 40 milliseconds of the waveform in yellow, and the frequency spectrum up to 234 kHz in orange. 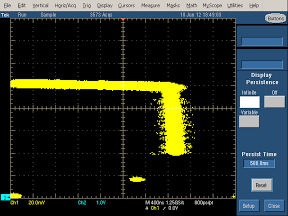 The low-frequency (right) images show 1 second of the output voltage in yellow and the frequency spectrum up to 600 Hz in orange. 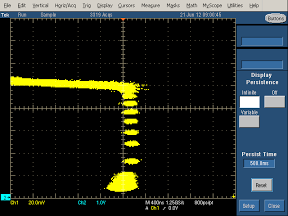 Because the frequency spectrum is measured in dBm, it is logarithmic; every division higher indicates 20 dB which is 10 times the voltage and 100 times the power. The chargers use a design called constant-voltage, constant-current (CVCC), since they provide a constant voltage (and increasing current) up to the maximum load and then a constant current (and decreasing voltage) if the load continues to increase. The Apple 3GS Environmental Report gives some efficiency measurements for the Apple USB Power Adapter. It lists 0.23W no-load power and 75% efficiency. These values are reasonably close to my measurements of 0.195W no-load consumption and 73.6% efficiency. Measuring these curves was a bit tricky. I used a NTE2382 power MOSFET transistor as a variable load, manually varying the gate bias to generate the load curve. The transistor needed a large heat sink to dissipate 10 watts. A more complex dynamic load circuit is described here, but the simple circuit was sufficient for me. The graphs were generated using the X-Y mode on the oscilloscope, with the load voltage as Y and the current as X. I used a .12&ohm; current sense resistor to measure the load current. This works out to 1/6 amp load current per division for the 20mV/div traces (most of them), and 5/12 amp load current per division for the 50mV/div traces (the high-current devices). Note that increasing load corresponds to a decreasing resistance across the output: the upper left has infinite resistance (no load), the lower left has zero resistance (short circuit), and the resistance decreases in between. Since the power (in watts) is voltage * current, the maximum power is in the upper right corner, approximately 4W in this case. The load resistance can be computed by Ohm's law, e.g. middle of the upper curve: 5 V / .4 A = 12.5&ohm;, upper right corner 5 V / .8 A = 6.25 ohms. Middle of the right hand curve: 2.5 V / .8 A = 3&ohm;, overload point = .5 V / .8 A = .6&ohm;. Most of these chargers aren't made by the companies that sell them, and there are some interesting facts about the manufacturers. The manufacturers of the chargers can be looked up from the UL certification number. The oblong Samsung is made in China by Korean RFTech, a manufacturer of mobile phone products. The Samsung cube is made in China by Korean power supply manufacturer Dong Yang E&P. The HP charger is made by Foxlink, who also makes the iPad charger for Apple. The counterfeit chargers are made by anonymous Chinese manufacturers, despite what they claim on the labels. The Monoprice is made by Golden Profit Electronics (formerly ShaYao Electric Factory Three - no word on what happened to factories One and Two). 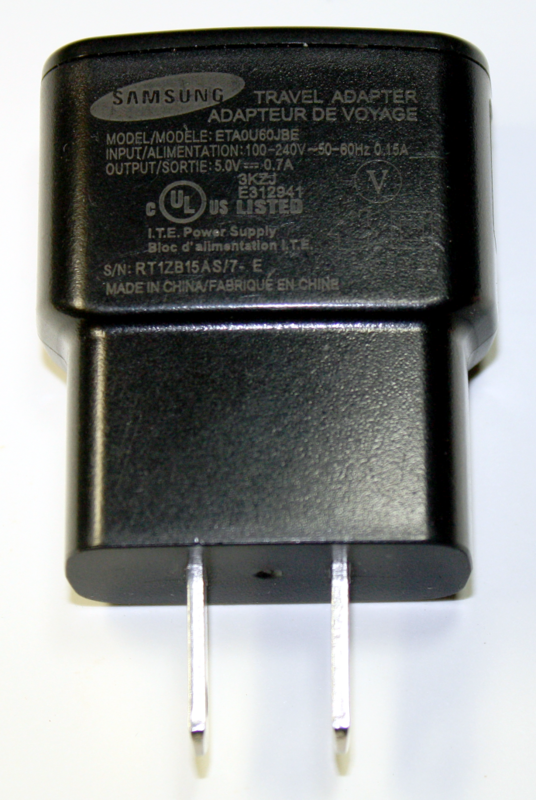 The Belkin charger is manufactured by the obscure company Mobiletec of Taiwan. The KMS charger doesn't give any clues as to the manufacturer, and I can't identify KMS as a company. The Motorola charger is built by Astec (now part of Emerson Network Power). Interestingly, Astec's big break was manufacturing power supplies for the Apple II, as I discuss in my article on the Apple II power supply. Apple uses a dizzying variety of manufacturers for their chargers. The iPhone charger (A1265) is made by Flextronics, the UK charger (A1299) is made by Emerson Network Power (except the one I have is counterfeit), the iPad charger (A1357) is made by Foxlink Technologies, and the Magsafe (ADP-85) charger (not discussed in this article) is made by Delta Electronics. 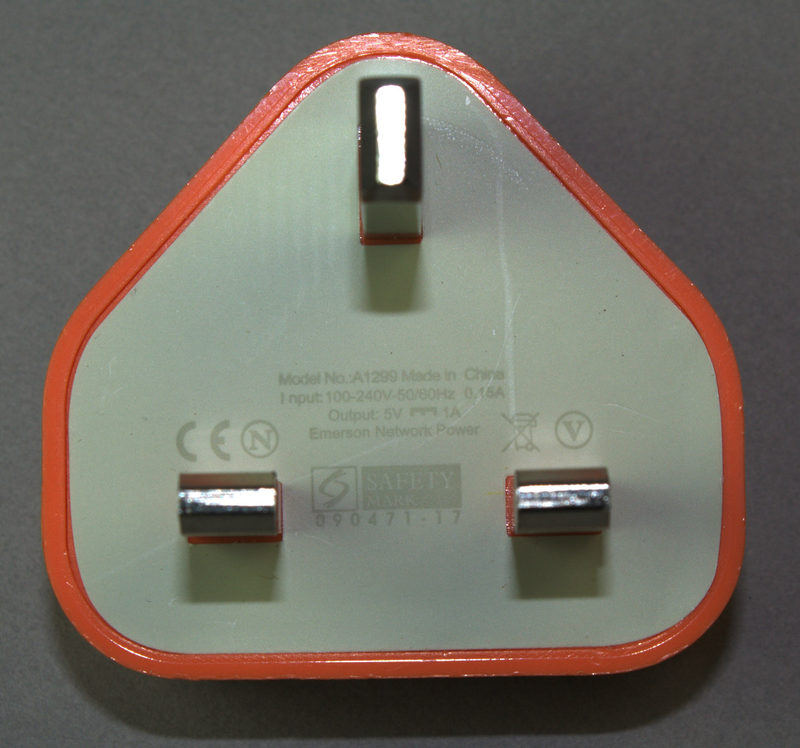 The A1385 iPhone charger often comes with the iPhone 5 and looks identical to the A1265 I measured, but is manufactured by Emerson Network Power instead of Flextronics. I am told that by using multiple manufacturers, Apple has more negotiating leverage, since they can easily switch manufacturers at any time if they're not happy with the price or quality. Confusingly, Foxlink (Taiwan), Foxconn (Taiwan), and Flextronics (Singapore) are all manufacturers for Apple with similar names. Foxlink (the name for Cheng Uei Precision Industry) and Foxconn (the name for Hon Hai Precision Industry) are entirely independent companies aside from the fact that the chairmen of both companies are brothers and the companies do a lot of business with each other (statement, Foxlink annual report). Foxconn is the company with continuing controversy over employee treatment. 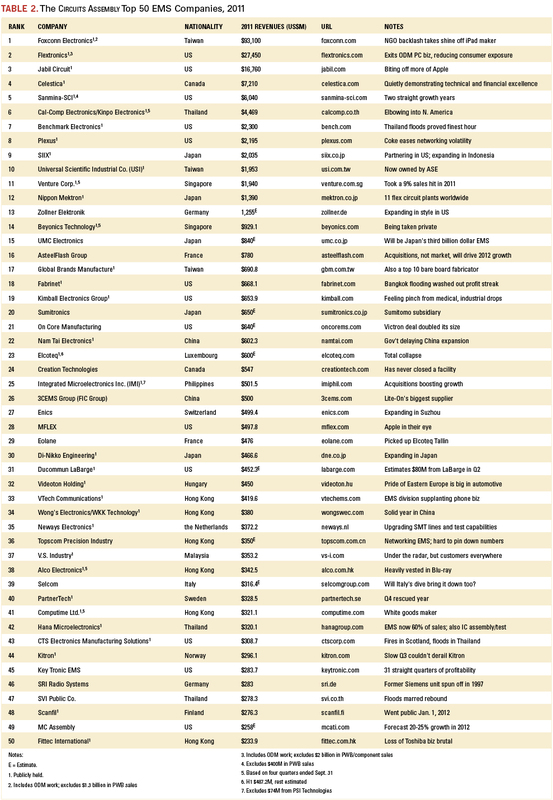 Foxconn and Flextronics are the world's #1 and #2 largest electronics manufacturing companies according to the Circuits Assembly Top 50. 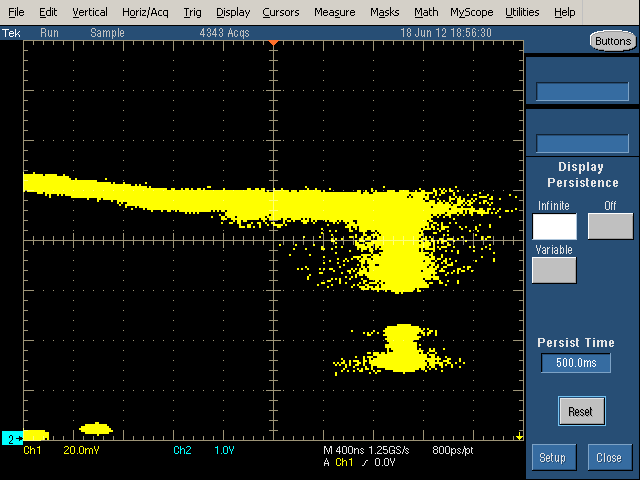 What model of scope and probes are you using? Thank you for the great article on usb power supply. I'm surprised to learn how bad the fake power supplies are. Be careful when shopping for usb chargers or batteries over Ebay. I've been burned with few bad batteries as well. This is awesome; thank you for posting it. Does using a chinese iPhone charging cable matter than the original one? Thanks for a detailed article. Hi Anonymous! 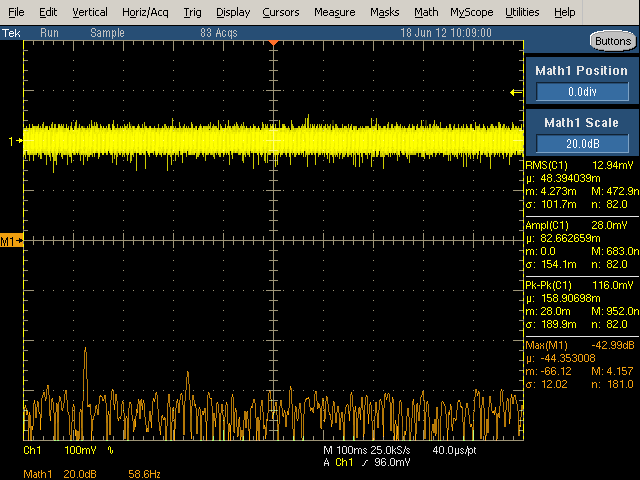 I borrowed a Tektronix TDS5104B oscilloscope, which is very nice but fiendishly expensive. 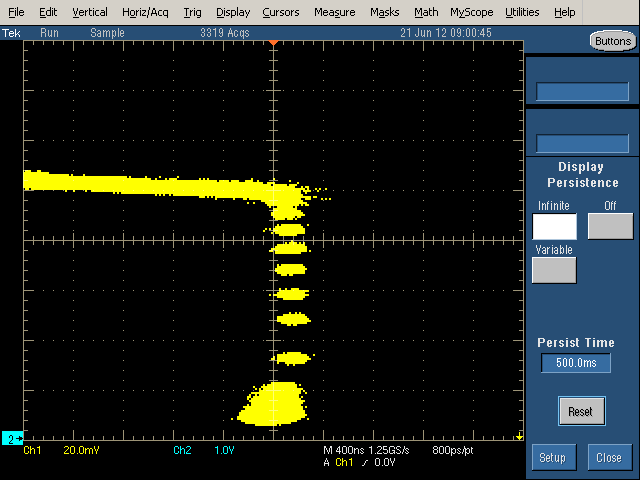 Instead of buying the Tektronix, you might want to get a Rigol and a new car :-) I'm not sure what probes were attached. Anonymous #2: the charging cable shouldn't matter, unless it's really bad. I'd love to see this done for a set of vehicle 12V to USB converters (http://en.wikipedia.org/wiki/Cigarette_lighter_receptacle). Would that be possible? Great article! I'm curious what tools did you use to measure power curve? Very cool! I had some an eletronics lab where we designed basic linear sources, very nice to have a look at real world! Thanks for the comments. 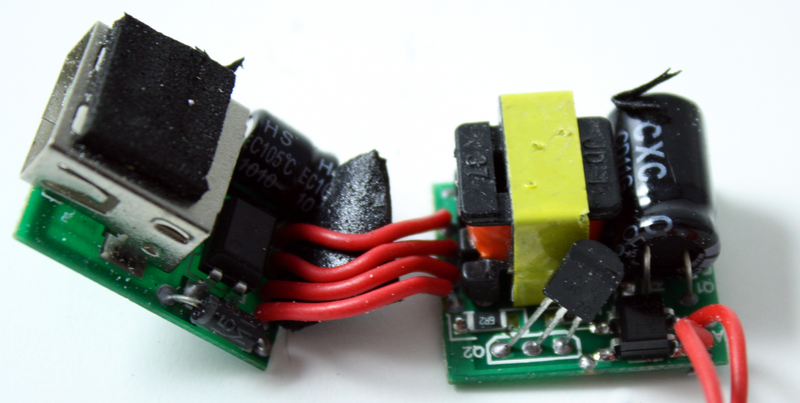 LeMadChef: 12V converters would be interesting to examine; perhaps a future article. 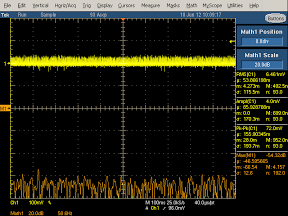 Waskita: to measure the power curve, I used a power mosfet as a variable load, and plotted the voltage and current with an oscilloscope as I changed the load. See footnote 16 for more details. Is it dangerous to use a high output power charger, like the HP TouchPad one, with a low consumption device, like a phone? My problem with USB wall chargers however isn't the quality or quantity of the power but just that it works at all with *all* my devices since different manufacturers have different ways of screening out wall chargers. Currently the *only* one I've found that does the job is the Sony PS3 controller charger. The only one I've found that can charge two iPads (or an iPhone and an iPad) simultaneously. Be curious how they rate in your tests. The blackberry playbook charger would be a good one to check out as well. I've been using one of those to charge everything recently. Thanks for the well explained walk through! I recently purchased one of these on eBay, and it actually blew up when I dropped it! Thank you for an informative read. Can you do this comparison for genuine original laptop AC adapters and a cheap aftermarket one? I am curious as to the differences between a $80 original from Sony and a $15 third-party one. Perhaps you can do a test based on your current laptop so only need to spent a few dollars on a cheap one to compare it with? Interesting article. At the beginning, you mentioned "noisy power that cause touchscreen malfunctions". I'm going through the source you linked to, but I have had this question in my head for a while now, so I'll just put it here. In India, we have 230V/50Hz and my Samsung charger says 150-250V/50-60Hz on the label. For some reason, Indian Railways has 110V power sockets in trains. When charging phones in the train, it always happens that the touchscreen goes wonky. Different phones show different behaviour, from totally non-responsiveness to very heavy lag or some offset in the touch location. So that would mean that the power coming in from the train sockets is very noisy. In that case, how much blame do we assign to the charger for not filtering it out? Great post. Please analyze more chargers, like the Amazon Kindle PowerFast. Also, it would be good to understand the Android situation, where I understand the data pins have to be shorted together in the charger or cable (?) or Android phones only charge at 500ma. My guess is the voltage sag is intentional and helps to reduce the power dissipated in the wall charger itself. There is no need to maintain exactly 5V at the charger output when the battery is at a low charger level.As along as the sag does not extend lower than 4.35V r 4.2V at full current, the the battery will charge just fine. I have a suggestion for an article topic.. I was totally surprised that various cables I have around the house have totally different charge rates. Apple cables seem the most consistant (figures) and ebay specials can lose 1/2 the power going to my iPad. You can make Apple-compatible non-standard charger into standard 2000 mA supercharger by connecting +D to -D. Thereafter it wont charge Apple of course, but who cares. So the author should have tested first if the charger was a standard USB-charger or Apple-crapped. Because now the test results are useless, because non-standard charger can deliver only max 500 mA to a standard device. Interesting that the HP touchpad charger won - it's the charger we can't stand to have in the bedroom. 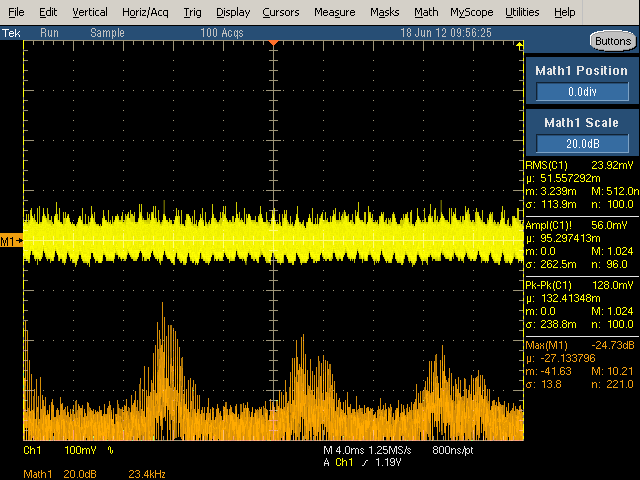 When not under load, ours gives off a high-pitched (like 10khz) whine that drives us crazy. One thing I'd be interested to see would be how this maps on to the European insistence that everything use a micro-usb cable, so that people can minimise the number of charges they own. It seems to me from your article that phone manufacturers are still only paying lip-service to such a standard, if the charging voltages are being provided on distinct pins. Have you ever come across the Momax brand of chargers. It's a fairly well-known brand of third-party chargers in Hong Kong and Mainland China. Their chargers seem to have a fairly solid build, just from the looks. I own a car charger and a BS1363 charger of this brand (model UTC0501000). I would love to see an analysis, especially one of the BS1363 ones. Iwould love to see a similar set of tests that included some wall sockets with built in USB chargers. There are several models on Amazon that range in price from $15-$30. It is really tempting to be able to plug a usb cable right into the wall rather than having to use a bulky adapter. Please report the items with fake UL livery. Awesome! Was an eye opener and brought up a lot of good points that I never considered. Would it be possible to do the same thing with Car Chargers? As most of the time I have to charge my phone in the car. There is no reason for a powersupply to HAVE a constant-current mode. A charger rated at say 1.0A, could provide a straight constant-voltage line up to 1.2A and then shut down entirely. The problem is, you'll never supply the startup-current of a few capacitors on the output this way. Anyway, in practice you're right, most have a constant-current phase leading up to the "overcurrent shutdown". staples has a usb charger (made in china)...is this a knockoff?? Ken, do you know what the max draw is for an iPhone 4 or 5? Would they benefit from using the 2.1amp charger? Please review the AT&T Zero Charger. Does it really use 0 vampire power when not plugged into the phone? Do other chargers shut off when unplugged? What is the quality of the power? Can you test some HTC chargers? I just want to say thanks for the very comprehensive analysis. any links to an online store that sells genuine chargers at affordable prices? You seem overly concerned with the voltage of the Apple adapters. The USB spec allows the supply voltage to vary between 4.4V and 5.25V, so a USB device has to be able to use these voltages. So the iPad power supply drooping down to 4.4V is not a problem. Also the iPad supply is advertised as a 10W adapter and that's exactly what it delivers. It seems perverse to mark it down for living up to its specification. The power supplied is a USB nominal 5V, which is allowed to be as low as 4.4V. I have a general question: I have moved to India and am using my US chargers at 220v. I also have some stepdown transformers for the things that require 110v. In general, would it be better to charge through the transformers--IOW, do they help to prevent surges and spikes? Since HTC is doing well with their phones these days, why not review it. A teardown would be nice too. Oh, and the Apple MagSafe chargers too! That was an awesome article, I have been buying some of that junk, no more. Can you please test some of the new hard wired USB power outlets that have two USB ports and a standard receptacle. I put in a few Leviton ones and now I only need chargers when I travel. Great article, I never knew there was so much to tell about USB chargers. Like a couple of others, I would also like a test of an HTC charger. Great article. Thanks. 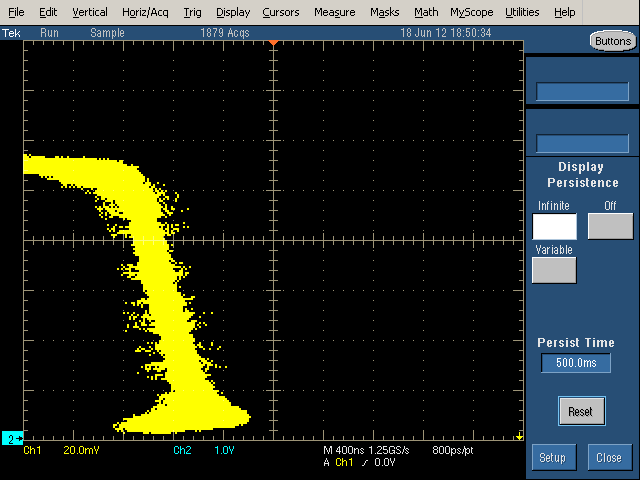 The oscilloscope graphs tell it all. As a matter of interest how was the fake UK charger connected to the the (presumably US) power supply? Was any attempt made to separate the effect if any of the socket adaptor from the device performance? 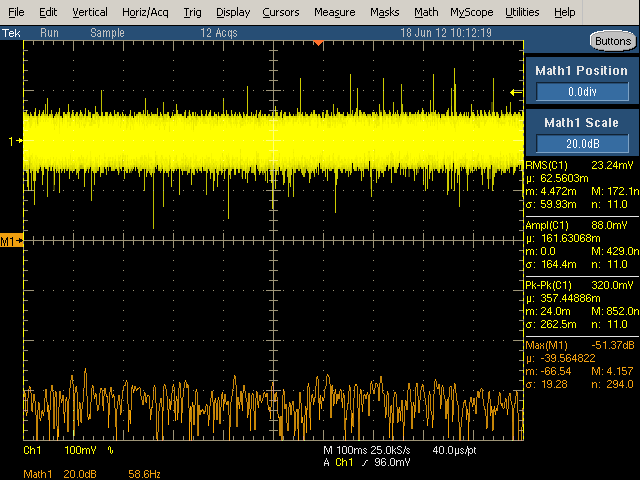 Also looking at the oscilloscope traces I suspect that not only was this tested only for 230V but also only at 50Hz. Thank you so much for the fascinating article! I really enjoyed it and certainly learned a few things. Great article. Really wish this was included http://www.henca.com/index.php?sp=&p=6&cat2=107&cat1=136&cat0=63&id=1692&cat1=136&cat0=63&new=&s=d6930f90f6961541aefd62e4c8ca7708&lang=en. It's marketed as a premium usb charger and seems to be pretty nicely made. Thank you so much for posting your findings! I'd bet it probably took you a long time to buy the charges, evaluate all the different measurements and present your findings. I am grateful for your hard work. Can you test some Scosche chargers. They seem to be a very popular aftermarket choice for chargers, making single usb, multiple usb, car chargers, 1A and 2A chargers. Great analysis and data! The reason that holograms aren't used is that they only add a few cents to the cost of counterfeiting an item. Holograms are old news; you can buy stacks and stacks of "authentication holograms" in shenzhen. Shocking (pun not intended) and interesting article. Great article, i was looking for some more information around these chargers. Is there any chance there is a car USB charger variant in the planning ? Question: if you've been using generic cheapo chargers with no ill effects does that mean they're okay or I should stop using them because they will damage the phone over time? Nice work. This is interesting. In light of the capacitor plague (please see Wikipedia). Do you have any intentions of testing older power supplies. In my experience Apple power supplies, at least until 2010, suffered terribly from that. Also, could you make one graph that shows the voltage output, versus amp draw, of all the power supplies. The votes are all in and "car charger" won for the charger that people are most interested in. Kindle narrowly edged out iPhone 5 at the end. Thanks to everyone who voted; stay tuned for more teardowns. Many people asked about cables. I found an article where someone tested cabled. The quick summary is cheap cables have higher resistance which makes charging slower. 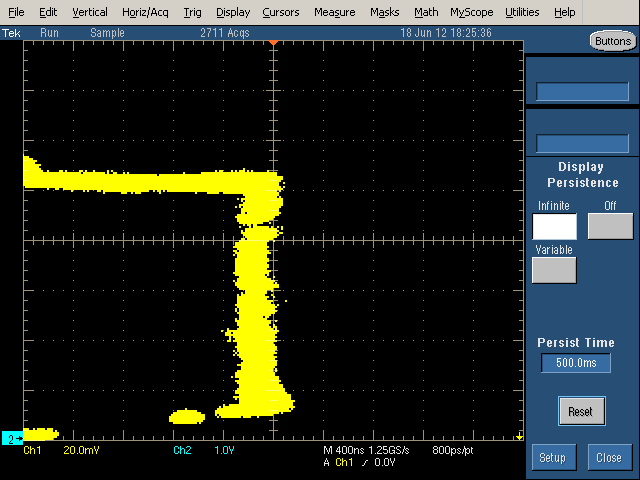 Anonymous with the step-down transformer: My guess is that using the step-down transformer provides a bit of filtering if the input power is bad (due to its inductance), but it wastes some power in the process. In India, I just plug US chargers into 220V (after carefully reading the label to make sure it will take the voltage). I use a Kensington travel adapter, which converts the plug format, not the voltage. T_Beermonster: I plugged the fake UK charger into 120V through the adapter mentioned above, which doesn't modify the power at all, so it's just 120V 60Hz into the fake UK charger. Andrew S: thanks for the info on holograms. Andsetinn: I probably won't be testing computer power supplies as tomshardware and jonnyGURU cover them extensively. i am looking forward to a car charger version of this comparison. thanks for the great thorough info! There are lots of comments about testing brand Bb and aaaa. I think the only way the author can test is to send him two units! I would like some clarification about the "Indicated charger type" test. What is used as a load? An iDevice? A resistor? Various device depending on the charger? I see a lot of ebay listings for the hp touchpad charger that ship from china for around $6. They all say genuine, and have pictures if what appears to be the real charger, but I'm skeptical that they are fakes. Anyone order one? There are most definitely fakes of the hp charger out there. Be skeptical of any shipping from china. They are most likely the Kmashi charger that looks identical in the listing. Some listings go out and say it isn't the official one, while others say it is official. This is a great review, I'll be picking up another touchpad charger. Are you going to do a car charger review? I want to buy one of the dual 2A units, but I'll wait if you are going to review them. Too bad. You spoiled the review for me ;-) by your misuse of "eschew". The Belkin design doesn't AVOID the minimalist design of most USB chargers, it, too, has the typical minimalist design. Angus, thanks for your comment. What I mean is that chargers such as Apple have a minimalist cube design, while the Belkin charger adds multiple non-functional design elements such as ridges, swoops, and an oval shape to make the charger more interesting. The HP touchpad charger looks like a slightly larger version of my old Palm Pre charger. I checked, the prongs twist off in the same way, had that for years, never knew. It would be nice to see it tested too. Since the Apple chargers don't short D+/D-, does that mean that most devices won't attempt to draw more than 500 mA, even though Apple's iPad chargers can support up to 2A? Hello. Per your recommendations and data I purchased an HP Touchpad charger. When I connect it to my Ipad 3, the battery status indicates "Not Charging". My initial thought is that Apple "programmed" it that way to discourage 3rd party accessories. However not being an electrician, could someone tell me if there is any TECHNICAL reason why this charger wouldnt work with my Ipad, and why I won't benefit from the HP's superior specs? Hi Donnie! I'm sorry to hear that your charger isn't working. The problem is probably explained in the "Indicated charger type" section of the article, and footnote 6. Apple uses proprietary voltages on the middle two pins to indicate that it's an Apple charger, and HP uses different voltages to indicate that it's an HP charger. So the iPad can tell that it's not an Apple charger. One thing to check: does it still charge, even though the device says it isn't? I agree that noisy, spiky output can lead to instability and undesirable behaviour in sensitive electronics, such as the aforementioned touch-screens, while charging... but a battery isn't as picky! I'm not talking about extended voltage surges (which will overheat a battery or trigger a protection circuit), or insufficient voltage/current which simply increases charge time (but doesn't cause harm). Batteries will happily accept any electrons that come by. In fact, a battery should act as a great big smoothing capacitor. I'm not defending the junky Chinese chargers that might zap you, burn your house down, or simply don't work, but lets not get carried away and pretend like we're performing high precision experiments in a research lab. Most of us just want to charge a device, and you don't need to shell out a day's wages for a shiny crApple branded premium charger to get the job done. I still have an adapter from a Pong game console. It consists of a transformer, a single diode and an electrolytic capacitor. Ken, thanks very much for such an informative post. If you are at all inclined to test any of the additional devices people have asked for, perhaps you should set up an Amazon wishlist with them on and the people who want you to test them can buy them for you. 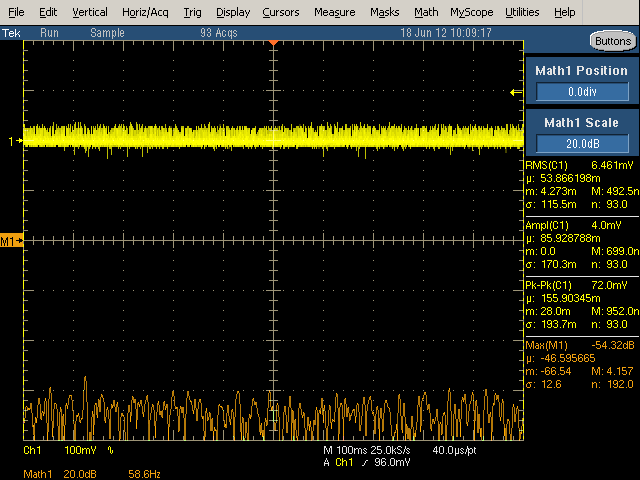 BTW For live-side measurements I use a Tektronix P5200 HV Differential probe - this has been an expensive but most-useful accessory and is good at rejecting stray-fields around switching supplies! Great article, and long overdue. If you redo the AC chargers in the future, could you see if you can do a conducted emissions test on the AC side? (With a CDN and Spectrum Analyzer.) As that would interest a lot of Ham Radio guys (and gals) out here. Some of these things can be very noisy when left powered, but not connected to anything. I have some very noisy car (12V DC powered) phone chargers too, the worst being a branded product that came with a phone! As someone else said, after market laptop chargers vs originals would be an interesting comparison too. 1) Would this be a good idea? 2) Which one would be the best power supply to use? You say your previous teardowns where "surprisingly popular", considering that your writing is a surprisingly good read for such a boring subject, and not only a good read, but a very thorough investigation of this important subject. Nobody -not on the web- has better consumer advice in this particular area than you have here on this blog. Hey Ken - this was super informative and I wanted to thank you for it. A charger is just some normal, every day piece of technology that people pay little to no attention to at all but as you've found out, they are not created equal and vary wildly in terms of performance. I feel like people don't pay enough attention to the brand or quality of charger and just toss whatever they can on to it as long as the plug fits. The results from your testing show that it is actually a pretty big deal and could result in some damaged electronics or even worse, a fire. Thanks again! I learned a lot today. The HP TouchPad charger absolutely must be inserted into the outlet with the USB interface nearer to the grounding plug. If you insert it with the USB interface away from the grounding plug it will not work. Great job on a very informative review. In checking around online and reading reviews and comments about the Samsung Cube (P/N ETA0U80JBE), it appears that if you can get one for less than $15 and it isn't a used one, it's more than likely counterfeit. If only the counterfeiters were as good at copying the electronics as they are at copying the packaging. 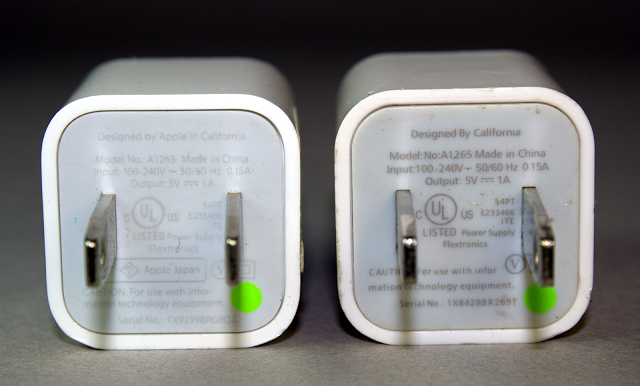 The Apple 10W charger has been replaced by a 12W version in the same packaging. * While no longer in production, the HP TouchPad charger is still very much for sale. I saw one just today for $28, and have purchased one myself for only $10 (on Amazon) as recently as last summer. * With regard to the one report in the comments of a high-pitched whine, I can only guess that was a defective unit--I own 3 of these, and none of them make any noise. * I also own several of the smaller HP Pre chargers--they have a lower amp output. If you're thinking of buying one, just get the TouchPad charger, instead. Awesome article and great analysis!! Thanks so much for creating this valuable resource! Interesting how Apple chargers are great. Coincidence? I dont think so. Its obvious that this tests is payed by Apple! But I will do the same thing, every penny counts. Wonderful, Ken! Simply wonderful! You've done a great job, comparing the minute details of all the chargers and revealing so much of information. Thank you very much. This is a very informative post. However, you cannot call "counterfeit charger" the ones you tested because none of them has fake "Apple" or "Samsung" (or the likes) printed in them. YOu can call them cheap/dangerous/whatever, but not counterfeit. Could you possibly add more power supplies to your review? I'm particularly interested to see how Apple's new 12w USB PS performs. Thank you for a great, well-written article. I find USB chargers very interesting. Can I ask: how did you measure the charging current? Did you just splice a multimeter into the USB cable? I would like to measure the current to accurately compare chargers and see if I'm getting what I paid for, but I'm no good with electronics. Hi AaronX. I measured the charging current two ways. I put a multimeter in the output circuit to get a simple current measurement. For the voltage/current graphs, I put a "current sense" resistor (a fraction of an ohm) in the output circuit and measured the voltage across it with an oscilloscope. Then Ohm's law gives the current. I used a dummy load rather than a real phone for these measurements since phones have a constantly changing load, which messes up the measurements. And I didn't want to destroy my phone if something went wrong. Thank you soooo much for the informative comparison, it is TRULY appreciated! what about charging through a pc usb?? i have a bunch of fake chargers for all my gadgets and i was thinking to charge them all through my pc after reading this!.. Have you ever tested any of the car lighter-to-USB adapters? Do you have any recommendations, or know of any to particularly avoid? Maybe you can answer this, though: Issues of output power quality aside, is there any reason to suspect that a generic car adapter could be a safety hazard? With just 12v DC going in vs. 120/220v AC, could it possibly burst into flames or electrocute you if it was poorly constructed? Thanks for a very interesting article! Thanks for taking the time to share this information! I've been an EE since 1979. Have seen the transition from the old transformer based linear discrete voltage regulator power supplies to today's modern switching/transformerless designs and their variants. While there are benefits as to size and weight in the new designs vs those of just 30 yrs ago I am still concerned about having this much circuit-density on a very small PCB inside of a sealed wall-wart case. Specifically with regard to external powerline surges and lightning strikes. Do they have a fuse? PTC's can short and fail in some circumstances. Also the ever-present threat of dubious quality counterfeit components from China. I have seen commercial service PS units and related sub-assy's fry and flame-out because of what turned out to be a counterfeit cap or off-brand semiconductor IC that failed in service, usually due to overheating from fab material degradation over time under load. I guess the rule is use prudent precautions and common sense when dealing with anything that's plugged into the 125VAC wall socket. Not only for the powered device but the infrastructure as well. You usually get what you pay for. Get the better stuff for peace of mind. A very well done and concise article! Can I translate your writing [http://www.righto.com/2012/10/a-dozen-usb-chargers-in-lab-apple-is.html?m=1] and repost in my blog? Anonymous translator: Thanks for asking. Yes, go ahead. Please make sure you credit me as the original author and have a link to this page. What language are you planning to translate it into? Voltage sag on any charger is not really an issue as long as it doesn't sag below the maximum charge voltage of the battery it has been designed to charger - for the iPhone and iPad this is 4.2V fully charged. Which is below the sag voltage you measured before the current limit was hit. Just found this blog when looking for information on HP touchpad chargers. Thanks for your time and trouble in putting together such an informative review. I would echo the comments of others, and say it adds to the evidence for why you should always try to buy good quality electrical products. For phones many people use the USB on their laptop/computer. If you are ever going to repeat these tests, would not it be interesting to include a handfull of U/I curves for a random choice of PC USB's? How do the stats from this company look? 8x2.4A with 4.81V under load and 40mV avg (80mV max) output noise. On the ipod/ipad charger, I don't think the metal post is for grounding. The original version of the charger had the post made of plastic and it kept snapping off. Apple eventually changed to a metal post. Excellent review of chargers. I'm very curious about how these various chargers respond to a short. 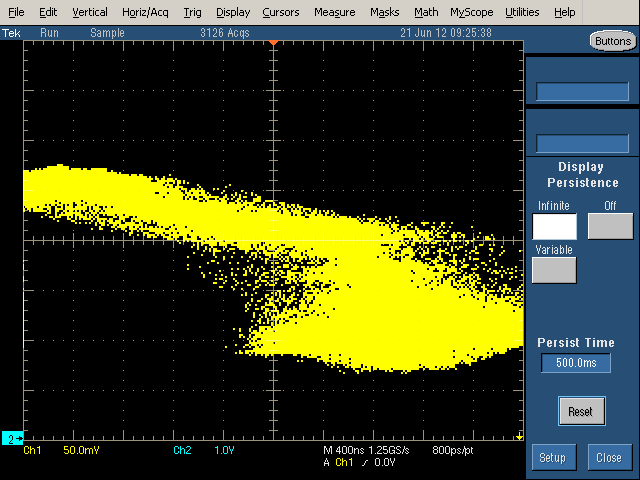 You show some data for each charger in your voltage/current scope plots. USB chargers appear to have some current-limiting circuitry in the event of a short, but surely they aren't all equal in this regard. Some must be safer than others. Thanks again for posting all this work. This is fantastic. I LOVE that you did the actual measurements here. This's a fantastic object lesson for sustainable electronics designers / engineers. Anyone checked this (http://www.ebay.com/itm/360593118865?var=630088056745&ssPageName=STRK:MEWNX:IT&_trksid=p3984.m1439.l2649) kind of usb chargers? Or all lowcost chinese chargers are worthless? Since it would be impossible for you to test every charger on the market, could you produce a layman's guide to choosing a good quality charger? "Ships from and sold by Amazon.com"
In a future review I hope you torture car DC to AC gizmos for sensitive gear like high end laptops. This is a really interesting article. I have heard that some chargers are not that great for the environment but maybe Apple products are? I think 2014 is a year that people should starting considering using products that are not harmful to our environment. After I learned about NA Power, I decided to switch power suppliers to get green gas. I use a lot of heat in my house so I wanted to make sure I was not harming the environment. I wouldn't knock myself out trying to get an Hp touchpad charger seeing they are getting scarce. There are plenty of other 4-rated chargers to try. Why? Many things like the Pi have onboard regulation that generates the necessary voltages for the components, as with lots of stuff like phones and laptops. Those onboard regulators can cope with a certain amount of noise and have a decent input voltage range. Laptops are a good example to use as their power supplies tend to be noisier than desktop power supplies because they too have an onboard regulator. Just stay away from the really bad ones like the counterfeit ones, they are dangerous anyway. But these things are built to be battery chargers most of the time so theres no guarantee of power quality. Although with portable touch screen devices becoming the norm and sometimes being ac powered all the time, these little chargers are getting better for such a small package. Generally most anything that is not really generic or counterfeit should be good enough most of the time. Great information. Im using all in charger for my apple iphone. Hi I want to measure the voltage and amperes of my charger by using my android tab or iphone. Is there any android or iphone app available that can measure voltages and amperes by just pluging the charger to the device. I would like to offer you free access to almost every charger (AC adapter),CLA, data cable, and cellphone battery in the market. I have over two million new and used OEM and aftermarket cell phone accessories in stock. if you are looking a batteries & charger then you have get information From the hitcell phone chargerwhich give a lot of information about batteries & charger . What about the lightning cable that has to be connected to this charger.. There are many unauthorised but still working cables in the market. Does it has any such performance differences ?? I actually have a model A1385 Apple charger made by Flextronics and not Emerson Network Power. This Blog is very Informatics & attractive Content written by Author . i m Really Impressed when Read Your Blog Thanks For Sharing Such As information . Thanks, now I know what don't buy from ebay! Hi! Great article! It's clear the effort you put into this, both in the testing and in the writing. I've used this post several times myself and referred it to others as well. What an incredible article, you have truly gone above and beyond. I write the odd article for iPad Repair and many people say the “Charging is not supported with this accessory” is a conspiracy to make you buy Apple products, but it may be that Apple are also looking out for their safety. It’s surprising just how similar the counterfeit chargers are, we’ve had a few dotted about the place, I find the UK iPhone chargers the most interesting as they can be almost identical. Even the one you have, apart from the color and that it is missing the “Designed by Apple in California”, they are almost identical, genuine ones also say “Emerson Network Power”. I also didn’t know it could be the charger that stops the touch screen from working, I will remember that as I’m sure it will come up in the future, I’ve learned so much from this article. What are your thoughts on multi charging stations, do you think they may be risking people’s devices? How about a high load vs temperature test to see if any charger would overheat. Minnesota -A Minnesota man's phone charger lands him a weeklong stay at the hospital. Tim Tyrell needed a new charger for his iPhone so he turned to eBay. The popular retail site sells knockoff chargers for a fraction of the cost of an apple original. Ahh, another article where the author says "Charger" where they really mean: "Power Supply". These days the charger is actually ON the phone. The wall wart is simply a power supply. Other than that, this was a good read. 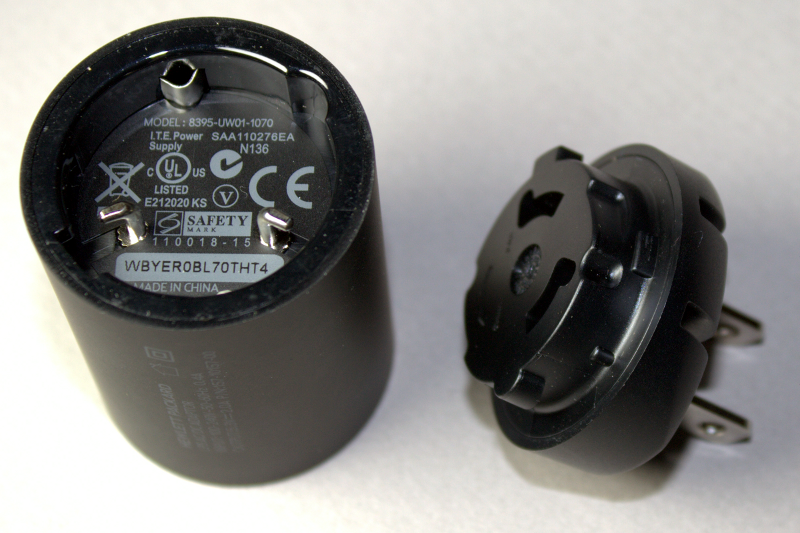 The "voltage sag" in the Apple adapters is a common technique. In the literature you'll see it mentioned as adaptive voltage positioning, line-load regulation or sometimes as non-zero load line control. It's been around for a very long time. Here is one paper that describes it. The example is specific to CPUs but the idea holds for any power source and load. You didn't measure transient response, which is admittedly tough to do right, so you wouldn't see the advantage it provides. I wonder if you've tested or heard anything on the higher quality generics - I saw you tested a Monoprice. In particular, I've been using two Anker products - a two port (one Apple and one Android port) 12V car cigarette lighter adapter, and a 5 port 40W desktop model. Both *seem* to be performing very well - no noticeable heat, devices charge very quickly, etc. What "hundreds" of volts are you talking about? Have residential outlets switched from 120v to 240/460v? I just want to say thank you for your work, it is a really useful comparison. Another death from fake charger, this time in Australia. Have you done any research on charging cable wire gauge? I'm sure you have been getting requests for years but have you looked at the Anker 40w 5 port charger? It's really popular on amazon and has a lot of reviews but it would be great to have the technical details to back up their claims. Even though I already bought one and use it daily without issues. Search amazon for AK-71AN7105-B5A and that should pull it up. I just went home to meet the fire department responding to a fire alarm at my home. The cause, my KMS-AC04 4 port USB charger overheated and started melting. It was so hot, the nightstand it sits on has burn marks and the smoke set off the house fire alarm. I've had this unit for over a year and used it daily with no issues. Today, thank GOD for the alarm system and fast response from the fire department. Many thanks for your insight. Certainly leaves me avoiding cheap chargers in the future. Great article... You really went out of your way on this one! I work in IT support and do service work on servers. I also do some support for Blackberry phones in a business environment. I am aware about the importance of proper specifications, and the safety aspects for chargers. I have had to deal with people who had their phone damaged from using aftermarket chargers. Great info! Thanks! Can you recommend a good USB power tester to check for crap before injuring self or stuff? To measure low-level standby power, a power analyzer is the right tool. Since many Samsung devices now require 5.3 volts to fast-charge, it would have been nice to see actual in-use charging voltage listed along with the in-use amperage. Very informative and drastically changed how i feel about usb chargers. Would you ever think of doing a similar rundown of car chargers? I was given a cheap one from ebay and it smelled of dying electronics from the moment it was plugged in. I trashed it and bought an off the shelf one form bestbuy and makes me feel much better plugging my phone into it. Excellent article. Great effort to put it together. Thank you for the time you've put in writing this post. Very well produced, throughout and informative. Have you evaluated wall plate mounted usb chargers? Congrats on a very interesting and well written article. I have been considering one of the "smart" multi-port (2, 5, 7) USB chargers. Looking on Amazon I've been surprised at how many users experience early failures of bramd name devices(e.g. see the 168 1* reviews of the Anker 5 port 40W USB charger on Amazon.com). I'm wondering if you have any recommendations for high quality aftermarket chargers (ideally 2-7 ports)? Based purely on user feedback the most reliable option appears to be the Plugable Power 5 port charger (2015). Let me know if you have any "safe" recommendations. I'm currently leaning towards the Plugable and would be happy to order a unit up to you for analysis, reveiw and teardown if you are interested. Wow, Explain very clearly, while leaving people understand that personal safety isn't able to return for a few dollars! The device's charge controller obviously dissipates the most heat when charging in the CC phase with the highest current right? when the voltage sags in this situation, the pass transistor has to drop less voltage across itself to regulate the current and hence doesn't dissipate as much heat. I read your entire article but still am confused.....will these chargers hurt or damage my IPhone5s. Wow, I would have never guessed how bad after-market solutions are. Thanks for the article. Subjectively, I liked first one better, even though it is less powerful. Any chance that to see the graphs on these or similar products? I'd like to add my vote for the Anker multi-chargers. We have three of these in the house: one in the living-room, one in the master bedroom and one in my office. Another observation I'd make is that Apple did something in the latest iOS upgrade; copy cables now don't work on the iPad Air unless they are either genuine Apple ones or licensed versions made by approved manufacturers. This means that the minimum price is now around £10 instead of £2-3. Which is a PITA if you want a couple of backups. Please do another round of testing and find me a USB charger. I have a LG G3 and its very picky about what Qi charger and USB charger it likes. When working above 1 amp most the wall chargers draw down below 4.5 volts and my phone disconnects from the Qi. I didn't even think of checking for noise and ripple and how that would affect the Qi. I would be interested in a test of automobile (cigarette lighter) USB chargers. Thank you for your excellent work! Exceptional work(, as appears to be usual for you, Ken), thank you very much! Only this year did I come across some new dual-outlet (supposedly-Apple-compatible) USB chargers (both 120V and 12V units, Vivitar; I guess they don't read your blog...) that my old ipod touch simply would not notice at all, even though they put out a decent 5V. Now (I think) I know why (footnote 6). Too bad it's virtually impossible to open these plastic puzzles without breaking them :( or we consumers could be sufficiently empowered by this knowledge to work around that. Excellent article! I have been running my C64 with a reasonable quality (Cygnett) aftermarket USB charger. There is a lot of debate about the quality of chargers for use on C64s, mainly because of ripple. My computer has been working quite well for a year or so now, but now I see there was a lot of luck involved since I had no clue there was such a wide range of quality! I may have to look for a 2nd hand Ipad or HP touchpad charger just to be sure. My HP TouchPad charger is not working. Do you recommend any replacement charger for this TP ? please test the fancy new https://www.gozolt.com charger. Hello, is this Samsung ETA-U90EWE real OR fake USB charger ? Hi Jimbo. That's an interesting question, if 240V makes a difference, so I tested the UK charger on 120 and 240 volts. With 120V, I could get at most 1.7W out of it, but with 240V I could get 2.2W. The higher input voltage helps some, but not a lot. 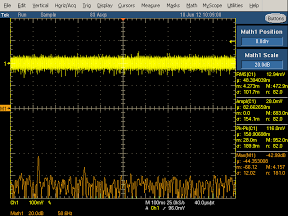 Either way, the charger's output power is a lot lower than the 5W it is supposed to produce. By the way, the charger says it takes 100-240V input; a genuine charger will work just as well with 120 as 240. Kite projects Is providing construction, engineering and facilities management to provide edge protection, vertical access and hand railing solutions to Industries in United Kingdom! I need to power a USB Audio Interface, the "NI Komplete 6". Will a USB charger work to power the unit, or do I need to find a proper USB power Supply? I can only seem to find USB chargers? wow, great articles. :) thank you. Im wondering whether you can do these kinda in depth reviews of popular powerbanks as well. Hi, thanks for the analysis. Any idea who supplies the ICs for these adapters? Who supplies to apple, Samsung etc? Great article! I learned quite a bit- I'm looking for a power supply that can handle the load from a Raspberry Pi 3, so this was very helpful stuff. I just wonder how many Chinese stuff we do have today on our markets and how would the world change if there would be no cheap Chinese gadgets. I have been using what looks like your Orange UK counterfeit charger to drive home-made pictorial illuminations constructed with christmas light chains. Our project is discussed at http://www.thevisitor.co.uk/news/lanterns-light-the-way-for-morecambe-festival-1-8275546 and orange is the color of the @ShrimpingIt project so we were keen to buy Orange 'Apple' adaptors, and pleased we could source them so reasonably. Both the computing devices which control light-switching (NodeMCU boards running from a 5V-powered 3.3V regulator) and the light chains (stepped down to 3.3V or 2.6V with 8A diodes, and switched with a TPIC6B595) seemed to be comfortably-powered, but I had assumed the labelled 1A rating was legitimate. I recently measured a charger which was drawing (multimeter-tested) 0.56A at 5V when the controller was powered up and all the light-chains in the illumination were lighted. I was therefore happy to send one away to be fitted at a friend's house. 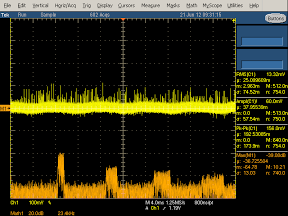 Although both the LEDs and the regulated NodeMCU are probably isolated from issues with high-frequency oscillations, it is a concern if there are any issues from the charger actually not providing 1A or from its build quality. Did you get a chance to tear down the Orange UK charger and check if there were any concrete safety issues, especially in the case that too much power is drawn for some reason? I am concerned if my chargers are also counterfeit, if you find they are actually dangerous in the configuration I'm using (up to 1A of LED lighting) and that I might be guiding people to use these at home. Learning from your teardown comments and also checking if they are the same by taking one of mine apart would be reassuring. Perhaps you don't mind destroying it now you have proven its limits? If you are interested in doing a teardown, but want some extras I am happy to post you one or more free samples/replacements from the collection (of 50 or so) that I'm building up. 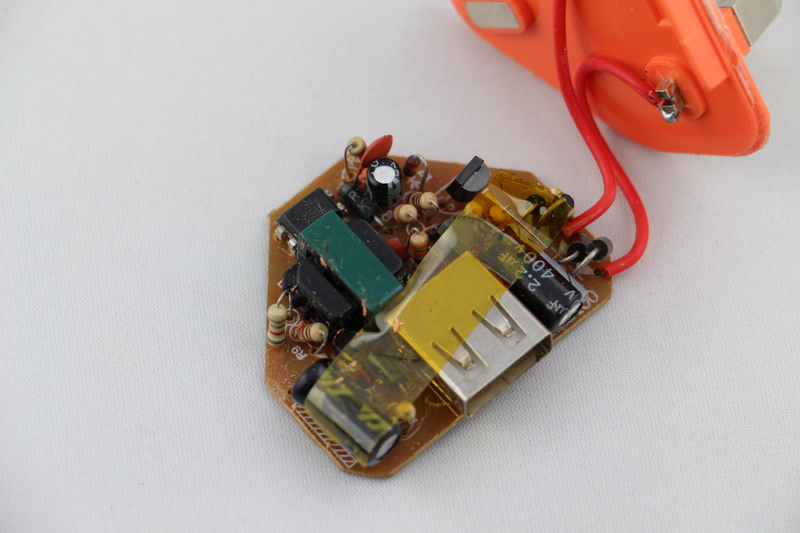 Cefn: I took apart my orange charger, although I don't know if it is the same as the ones you are using. Here's an internal photo and here's the circuit board. It's pretty dodgy - there's no isolation gap between the primary and the secondary. 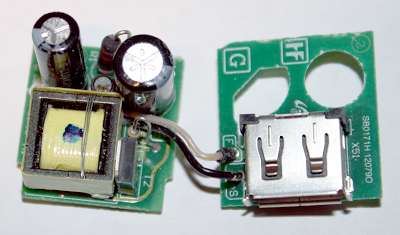 The contacts from the power plug are right above the USB plug; they put Kapton insulating tape over it, which is good. But they put it crooked so it doesn't accomplish anything. So it has the usual safety problems of cheap chargers. As for providing 1A: when I measured the charger, it didn't provide 1A but shut down cleanly well before there. 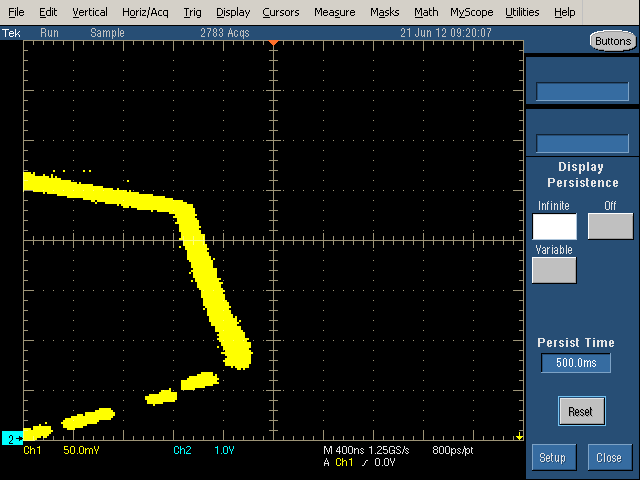 However, I was measuring with 120V, so it might do better with 240V. There shouldn't be a safety issue with overloading it; even cheap chargers are designed to limit current and then shut down under overload. Ken that is above and beyond the call of duty. Thanks so much! I'll take one of mine apart to check if it matches (more or less). As they were delayed on dispatch I managed to cancel the order of 50 chargers, meaning I still have an option of choosing my preferred device from Aliexpress. I'd really like to find a middle ground between getting financially stiffed on a £19 iPhone charger, and getting electronically stiffed on a $1.50 Aliexpress charger. This listing looked promising in that they share the circuit board, though not the tracks. https://www.aliexpress.com/item/High-quality-IC-1PCS-UK-5V-2A-USB-Charger-Adapter-For-iPhone-6-6-Plus-5/32411224027.html?spm=2114.01010208.3.361.QK9hl3&ws_ab_test=searchweb0_0,searchweb201602_2_10065_10068_10084_10083_10080_10082_10081_10060_10061_10062_10056_10055_10054_10059_10099_10078_10079_427_10073_10103_10102_10096_10052_10050_10051,searchweb201603_8&btsid=78681030-3df5-42d1-85ed-a1c96f54488e or there's a ton of devices like https://www.aliexpress.com/item/UK-Plug-AC100-240V-DC5V-2A-3pin-Charger-Adapter-Power-Supply-Adapter-Micro-USB-Jack-interface/32771607934.html?spm=2114.01010208.3.102.QK9hl3&ws_ab_test=searchweb0_0,searchweb201602_2_10065_10068_10084_10083_10080_10082_10081_10060_10061_10062_10056_10055_10054_10059_10099_10078_10079_427_10073_10103_10102_10096_10052_10050_10051,searchweb201603_8&btsid=78681030-3df5-42d1-85ed-a1c96f54488e which look like they have enough interior space to be laid out safely, but who knows what's really in them. 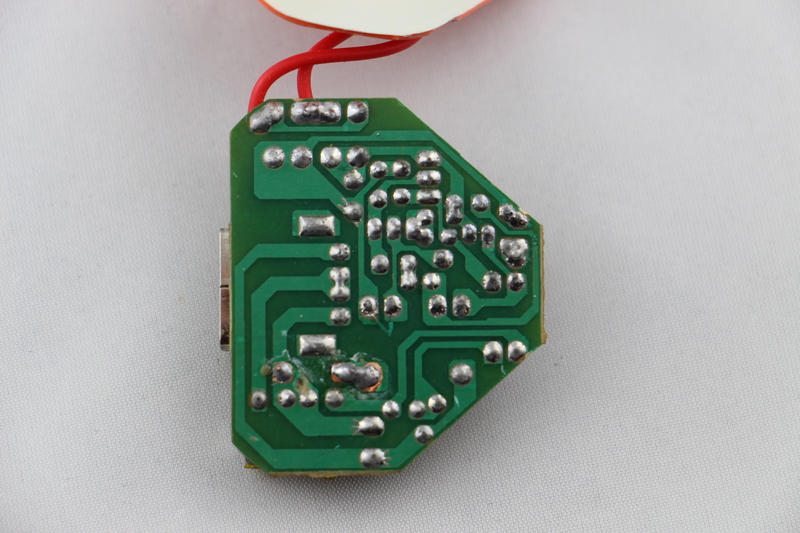 It would be really something to find an Aliexpress charger which wasn't deadly somehow, but not sure how to proceed. This is a really interesting article, and might cause me to reconsider a purchase I was investigating. Still though, it seems like the proprietary characteristics of the chargers don't actually have anything to do with the power, they're just protecting their own market, right? If so wouldn't the best charger just be the one that delivered the cleanest power (and was still accepted by the device)? I'm interested in buying a USB "charging station" type device that I can plug any of my family's devices into (iPhones, MP3 players, a kindle, maybe a drone battery now after Christmas!). Are ANY of those ok, or should I abandon the idea? Your awful numbers on the Bellingham charger made me think that even trusting a name brand might not be good enough. The Aliexpress listing at https://www.aliexpress.com/item/Free-shipping-200pcs-lot-USB-Travel-Wall-AC-Charger-for-Apple-iPhone-3G-4GS-4G-AU/456477632.html?spm=2114.40010308.4.29.cSKhjj shows a cheap charger which discloses its internal circuitry for all to see. Is this reassuring or terrifying? Hi. This article was extremely informative, but a lot of it was over my head. May I ask for your advice? I recently purchased a USB wall plate http://imgur.com/yDMWUHS that is labelled front and back as 2Amp but the average output was 0.35Amp. http://imgur.com/1zGg6d4 The highest output I saw was 0.41Amp. When a Samsung Galaxy S2 tablet is plugged in it says "Charging slowly..." http://imgur.com/IOxeGHb . When the tablet is plugged into the original Samsung charger, which is also labelled as 2Amp, the tester shows between 1.1Amps to 1.23Amps. I assumed the wall-plate charger was just dishonestly labelled but surely a Samsung charger wouldn't be that far off, or would it? To say I'm confused would be an understatement. Any help would be most appreciated. Unindoctrinated: the current rating for a power supply is the maximum it can provide. It's up to the device how much it actually uses, but it needs to stay below the maximum. Manufacturers use a variety of proprietary signals between the charger and the device to indicate how much current the charger can provide. Most likely, the wall plate is incompatible with Samsung, so the tablet doesn't know how much power the wall plate can provide so the tablet charges slowly. With the Samsung charger, probably the tablet only "wants" 1.23A even though the charger could provide up to 2A. For an experiment you could try cranking up the screen brightness to max and watching a video over WiFi and see if the tablet draws more current. im designing a 3A max usb charger (step down MP1584EN ) from 12v. whhat would you advise i use to filer the 5.30v output ? iv added 0.1uf and 100nf,1000uf. is there anything eles i can do ? Can you please do a review of the charger that can be found at https://www.amazon.com/gp/product/B01L8DVOFM/? Thanks in advance. Hi, thanks so much for this write up. I was researching the safest way I could easily power up my Commodore 64, which takes 9VAC and 5VDC. Once I learnt that cheapo 5V supplies can be very dire indeed I went on a quest to find the best ready to go solution. From your write up I settled on the HP touch pad charger- not only is it essentially top of the class, but it's also much less likely to be counterfeited. Win-win! Please, let me first tell you that your article and reaearch is simply awesome! BTW, do you know what the max draw is for an iPhone 6s/Plus? Do you know if they would benefit from using the Apple 12W iPad charger? I cannot find it anywhere, and in case of affirmative case, I wonder how much faster could the iPhone charge and if that faster charging (even if not much) could not slowly damage the battery at lonf term. What is your view?